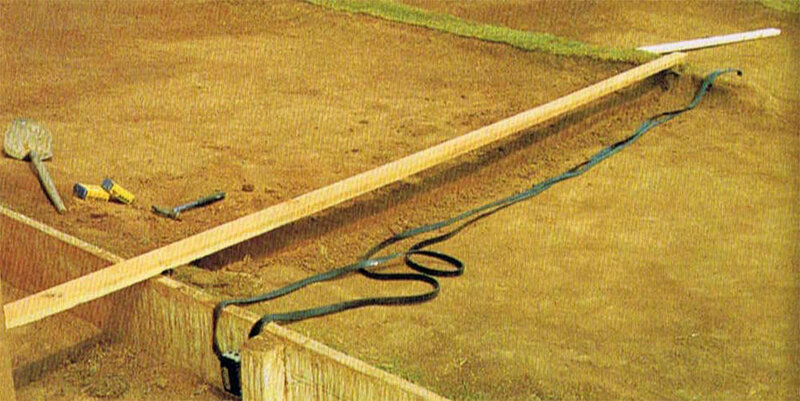 By 1985 IFMAR the world governing body for radio controlled car racing finally had opened their eyes to the 1/10 scale electric off road scene. 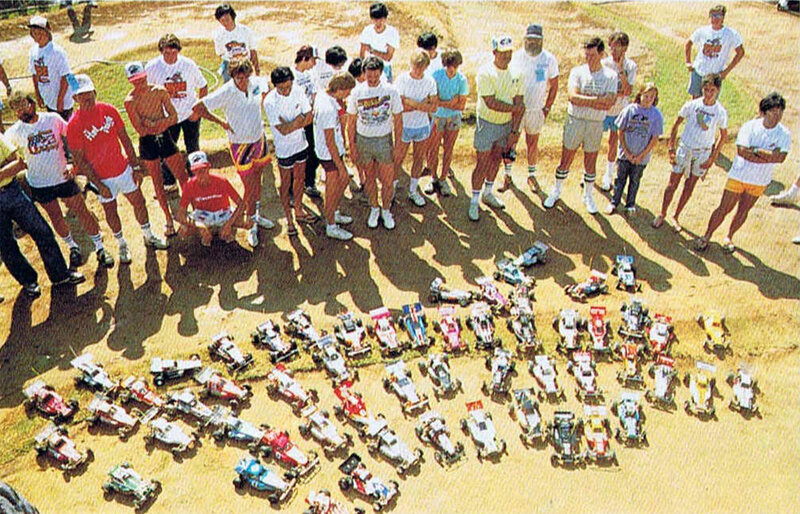 While there previously had been arranged unofficial world championships, 1985 was the year that the largest and most popular class in the history of RC cars were acknowledged, and granted their own OFFICIAL World Championship. 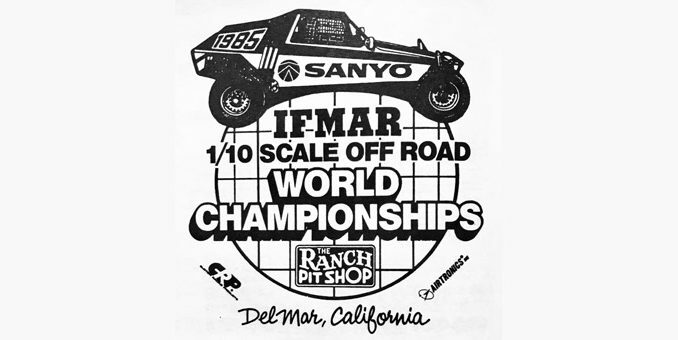 So which place would be better suited for this inaugural race, than South California, where the best racers and the largest 1/10 off road communities had their homes? 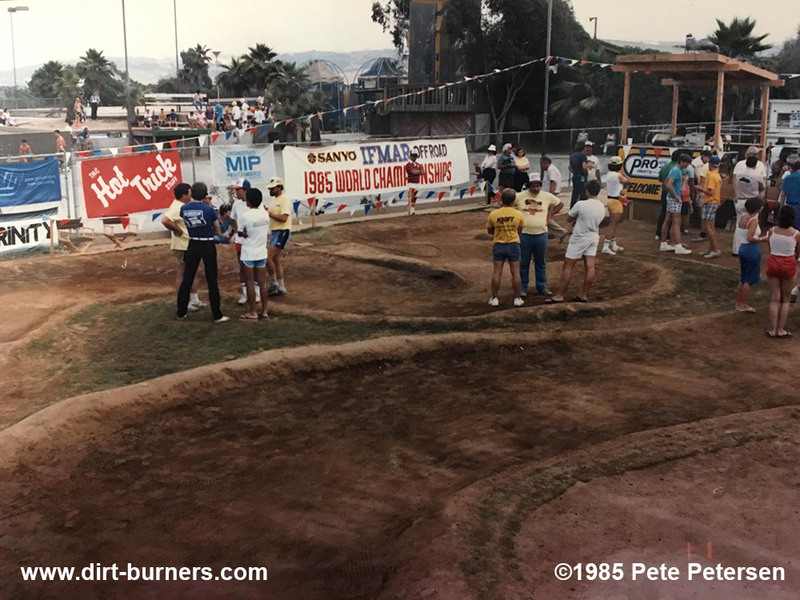 The venue for this first IFMAR 1/10 off road Worlds, that took place from July 8th to July 14th in 1985, was the “The Ranch Pit Shop Raceway” in Del Mar, owned by the Losi family. 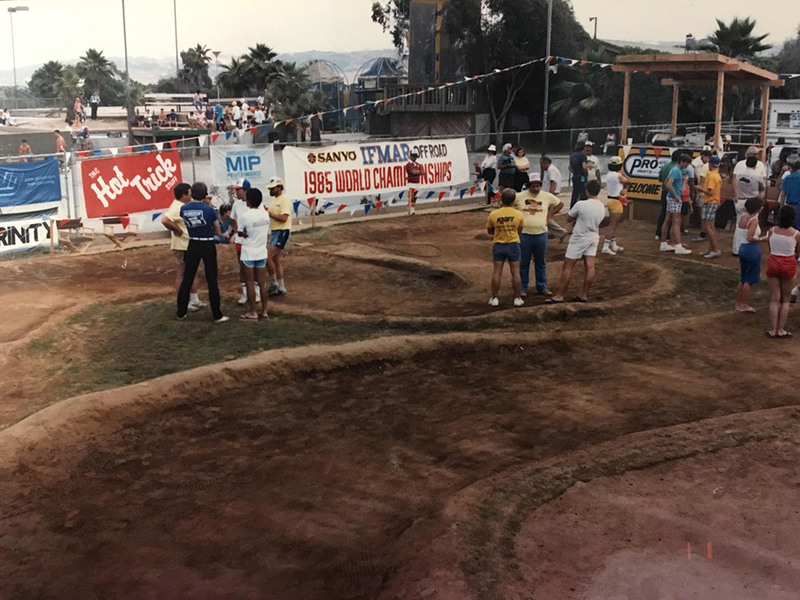 The Del Mar track is actually the third “The Ranch Pit Shop Raceway”, and was established around 1983 and was right beside a skateboard park called the “Del Mar Skate Ranch“. Both the track and skate park were demolished in 1987. This track is easily confused with the first, original “The Ranch Pit Shop Raceway” half an hours drive away in Colton, as the Colton track was right beside a skateboard park too, the “Colton Ranch Skatepark – Rancho Mediterrania“. The Colton track and skate park closed down around 1983. 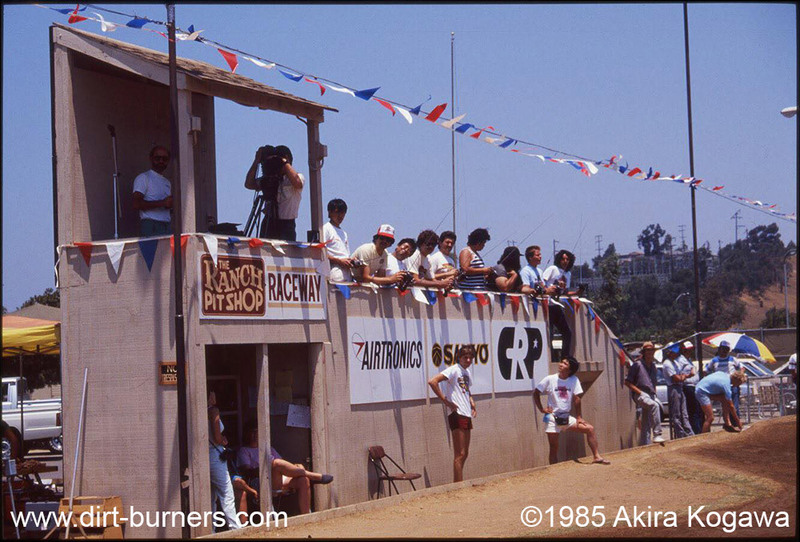 The second “The Ranch Pit Shop Raceway”, and the one most people seem to remember, was in Pomona. This track was previously known as “Thorp Raceway” and “Vehlie’s Pit Shop”. This was bought by the Losis around 1980-81. While working on this article I’ve learnt a few things about the different tracks and dates/years that contradicts what I’ve heard before, so I will have to revisit the article I did on the 1984 unofficial World Championships a while back. Among the things that was wrong in that article was that I believed they were at “The Ranch Pit Shop” in Del Mar preparing for the race, while they actually were in Pomona. I’ll fix that later. I also think I’ll some day will have to do a more comprehensive article on the three “Ranches”. I have now corrected the info above after receiving more detailed info from Jeff Maurer. Aerial photo of the location from 1986. 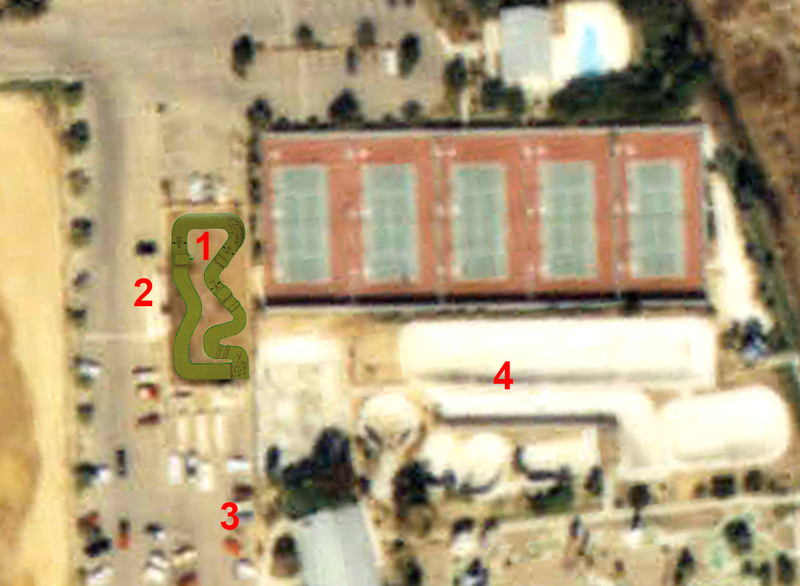 I have highlighted the track. 1. The Ranch Pit Shop Raceway, 2. Drivers stand, 3. Shop, 4. Del Mar Skate Ranch. 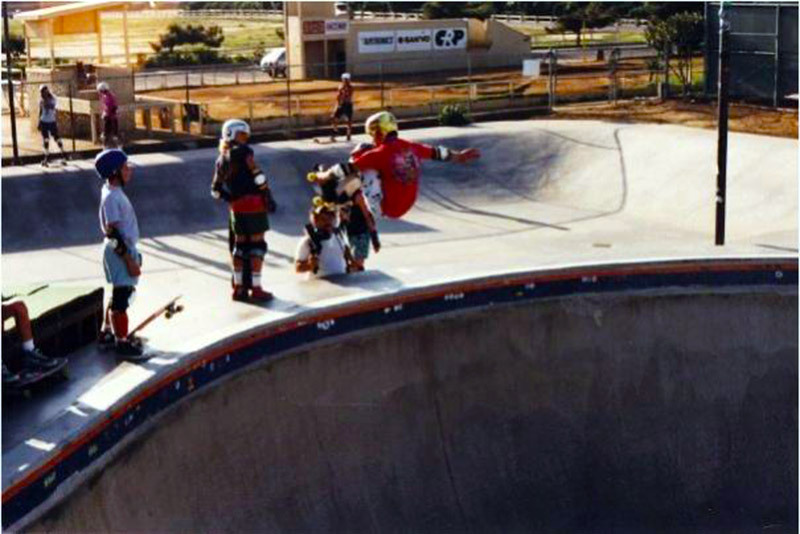 The “Del Mar Skate Ranch” situated right beside the track were the “home” of some of the worlds most famous skaters, like Tony Hawk and Ken Park. 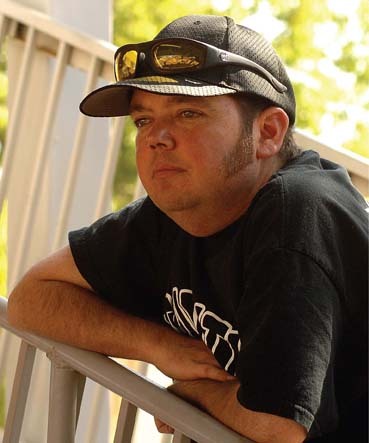 Allen Losi, Gil Losi Jr’s brother, had the “Colton Ranch Skatepark” as his preferred hang-out. A view of “The Ranch Pit Shop Raceway” from the world famous Del Mar Skate Ranch bowl called “The Keyhole”. Both Gil Losi Jr. and his brother Allen Losi were great skaters, but while Allen continued with skating, Gil Jr. started on his RC journey. 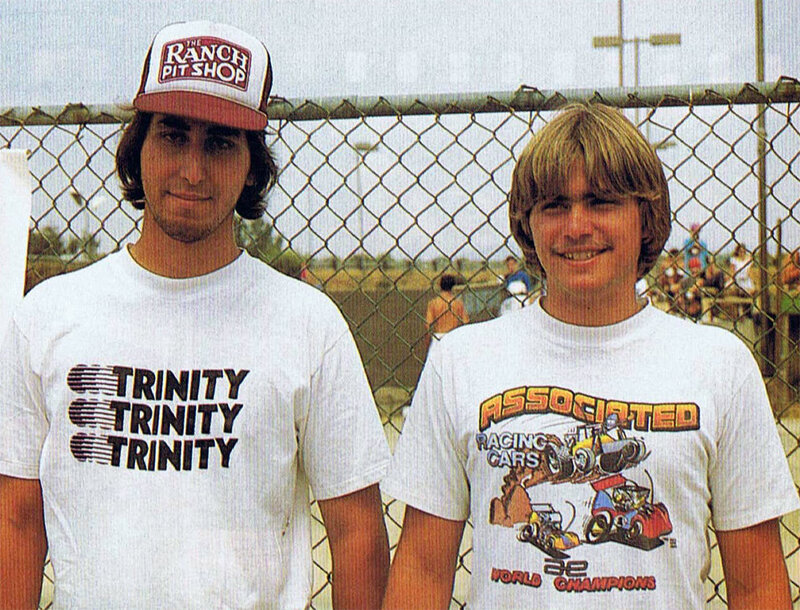 How many of you knew there were two “Team Losi”, one skate brand and one RC brand? The skate brand made skateboards named “Variflex”, and while the RC brand was later sold to Horizon Hobby, I believe the Losi family still owns the skate business, at least they did just a couple of years ago. 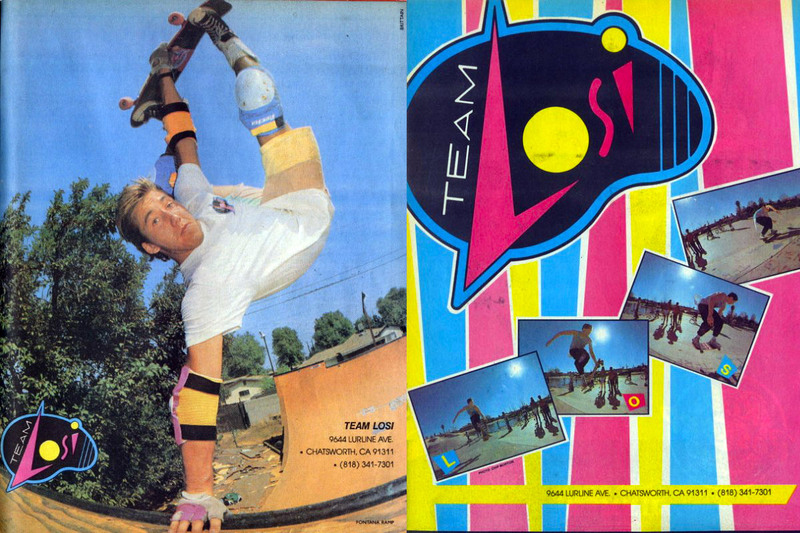 Team Losi skateboard ads, featuring Allen Losi, the brother of Gil Losi Jr. In this video from 2015 you can see two of the all-time greatest skaters, Tony Hawk and Kevin Staab, skate “The Wormhole” structure of the Del Mar Skate Ranch one last time, when it was briefly uncovered after everyone believed it had been bulldozed with the rest of the skate park, in 1987. The RC track would have been to the left in the video (see around 2:24). The fence you see facing the camera most of the time is to the tennis courts. Well enough of the skating, and let’s get back to the real stuff. Besides the obviously large contingent of North American drivers, there were also a rather large group travelling from Japan, but other than that there were just three racers from England, two from Australia, and one guy from South Africa. Even if Japan had a huge 1/10 off road community and came with a large number of drivers, they were not yet up to the standards of their American friends, it would show. 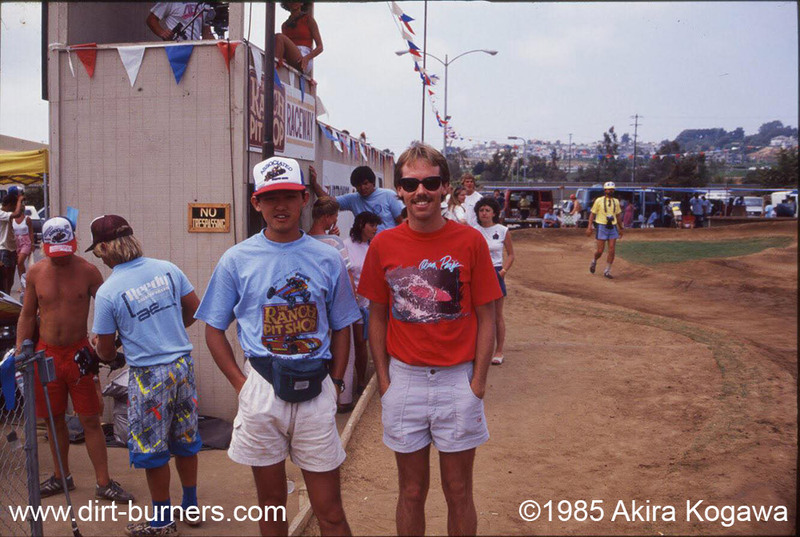 To be completely honest I don’t think the Japanese drivers that went to the 1985 Worlds were the best drivers in Japan. 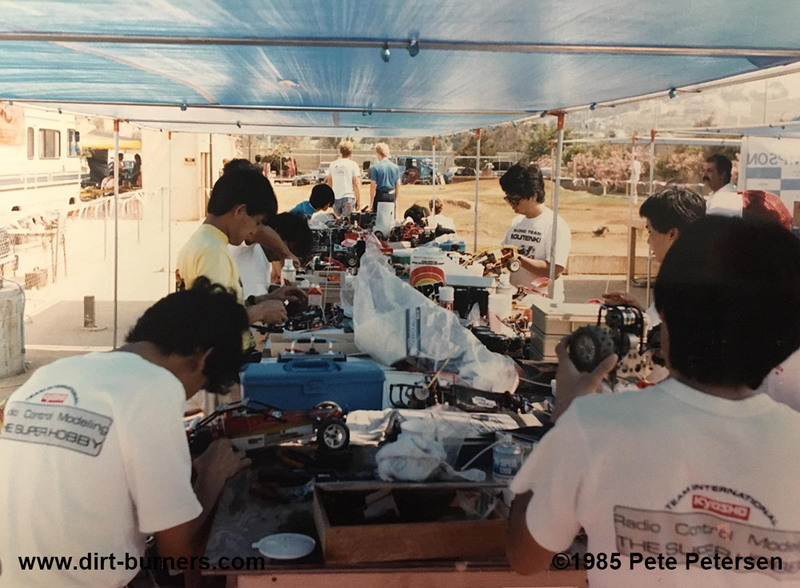 It seemed more to be a mix of designers and industry people, than the fiercest RC buggy pilots. That would of course change two years later when Japan unleashed Masami Hirosaka on to the world, and not to forget Katsunori Kondo who did the best overall total performance in 1987, with coming in second in both classes. 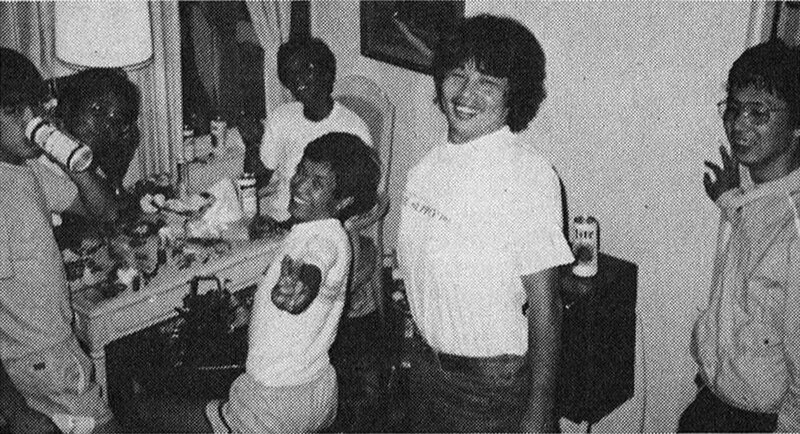 One of my all time favorite photos, the Japanese team from the 1985 Worlds. What a bunch of legends in that photo! From upper left: Hidetoshi Nagamine (Kyosho), Shigeru Hino (Kyosho), Masahiko Oda (Noutenki), Tetsuji Okamura (Proto), Tadashi Kurihara (Proto), Hiroshi Ohide (Proto), Yoshiaki “Kemur” Shimotori (Noutenki), Hiroshi Nakamura (Proto), Tatsuro Watanabe (Proto). From lower left: Masatoshi Kobayashi (Kyosho), Yoshiaki Fujita (Kyosho), Takashi Aizawa (Mugen), Keiichi Kikuchi (Mugen), Kazuhiko Nakanishi (Kyosho), Akira Kogawa (Kyosho), Toshifumi Watanabe (Kyosho). It seems every 1/10 off road worlds had it’s own drama. 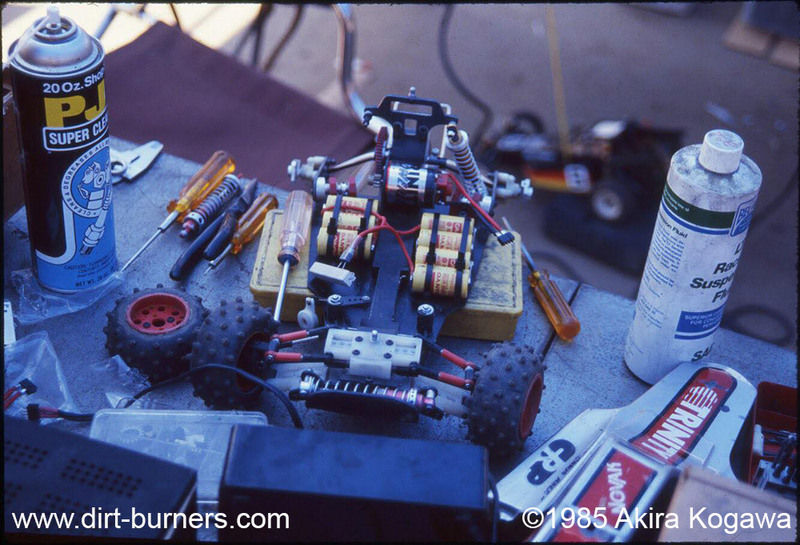 In 1987 there were much talk about the very hard track surface and the limited time for practice, and in 1989 it was the Yokomo tire size controversy. In 1985 the drama was more of the hidden kind, and it was all inside the Kyosho team. 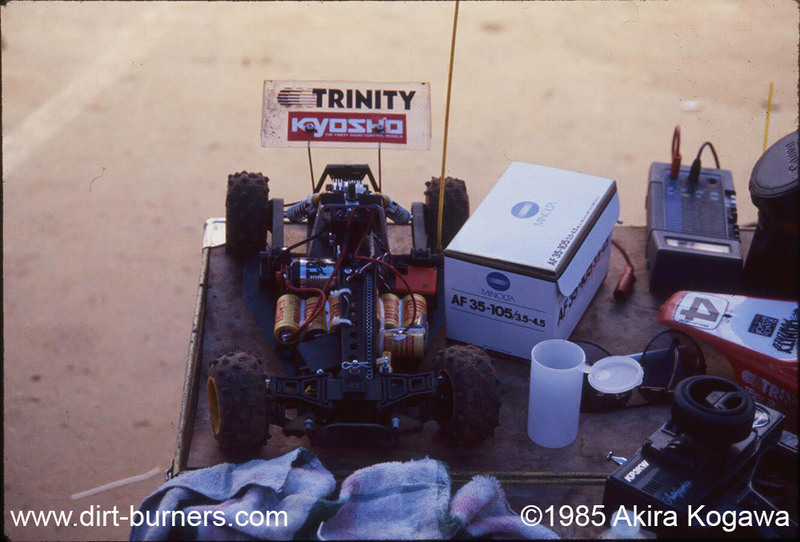 While the Kyosho design house Auto Model and Akira Kogawa had the 4wd Optima ready for the “Modified” race, Kyosho decided to wait with that model, and instead use the older 4wds Gallop from Auto Models competing Kyosho design house Syuwa Kogyo and designers Shigeru Hino and Hidenori Tsuno. 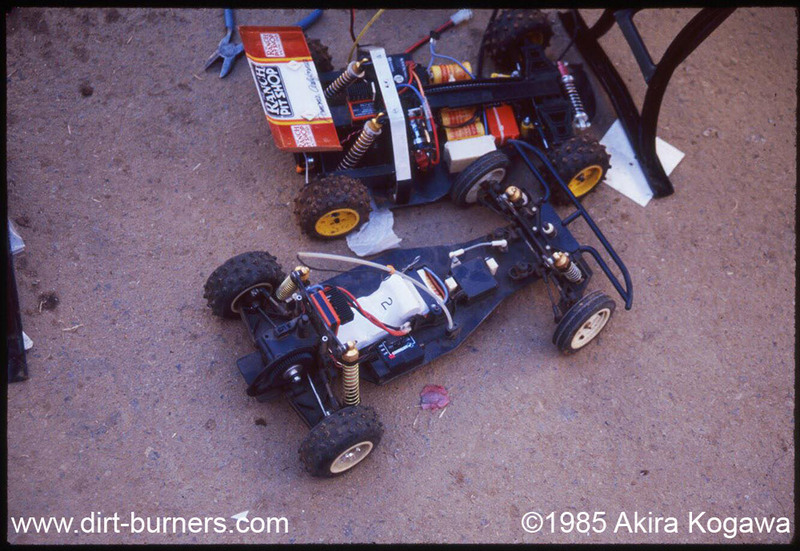 As a compromise the team used Auto Model/Kogawas 2wd Scorpion, Tomahawk and even the Turbo Scorpion (that was also yet to be released) in the “Stock” class. 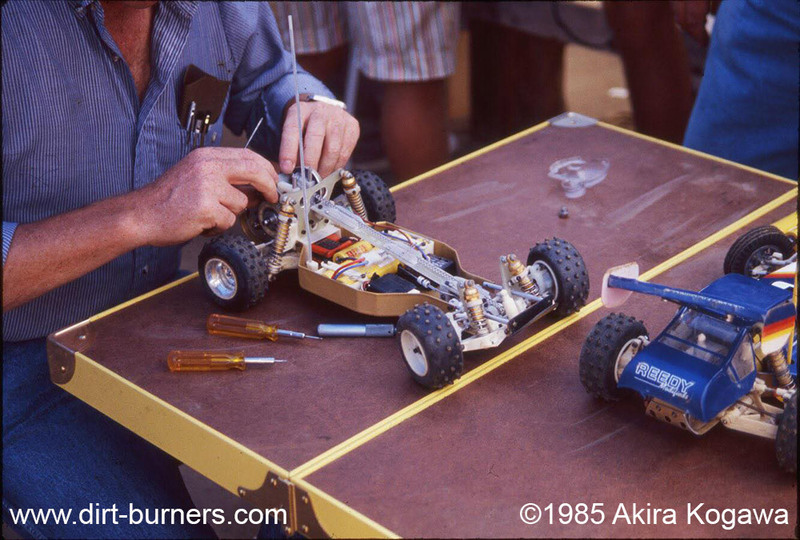 Kasuhiko Nakanishi and Akira Kogawa working on their cars in the pit. 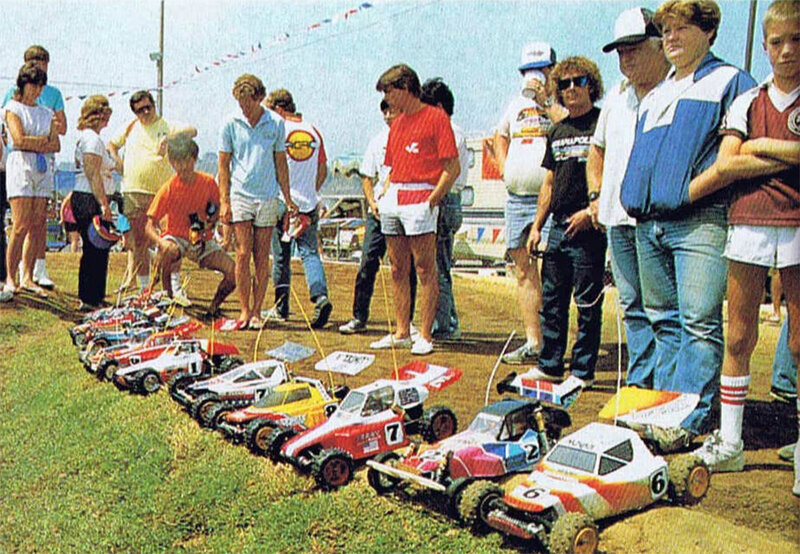 In this first worlds there were no separate 2wd and 4wd classes, just a “Stock” and a “Modified” class. The official reason for not taking the Optima, undoubtedly a much better and solid race buggy than the Gallop, is still unknown, but it’s believed to have to do with the competition between the two design houses, and the fact that Syuwa chief designer Shigeru Hino had seniority over a very young (but enormously talented) Kogawa. Kyosho released the Optima right after the Worlds, and lost out on a very good opportunity for some great publicity for the new model. In fact the Japanese magazines reviewed the Optima in the next issue, directly after the issues containing the Worlds reports. There is no doubt in my mind that an Optima prototype in the hands of a seasoned driver would have given Gil Losi Jr and the RPS/Yokomo team a real run for their money. But then I’ll admit I’m quite biased regarding that matter. Adding that not many of the Kyosho team drivers chose to use the Gallop, kind of says it all, I think. 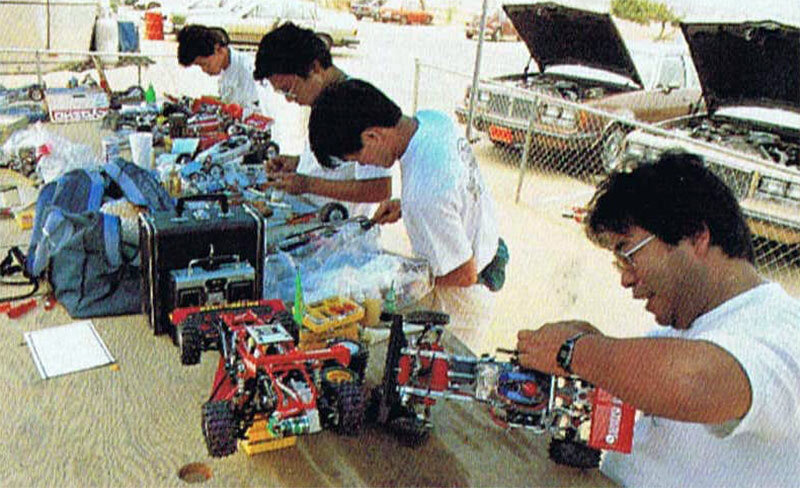 Hidetoshi Nagamine (front left), Akira Kogawa (yellow shirt) and Masatoshi Kobayashi (front right) from the Kyosho team hard at work in the pit, with Masahiko Oda of Team Nourenki in the background, working on his Hirobo Zerda. Kogawa himself used the same Tomahawk in both classes, just with 8.4v batteries in “Modified”, something he told me was very challenging on the “slippery” track. I’ll bet it must have hurt not being allowed to use the Optima that he’d been working so hard on, and that he probably knew was a better car than anything else on that starting grid….. But as we all know, and I’ve been saying time and time again, Kyosho work in mysterious ways. Even to this day. 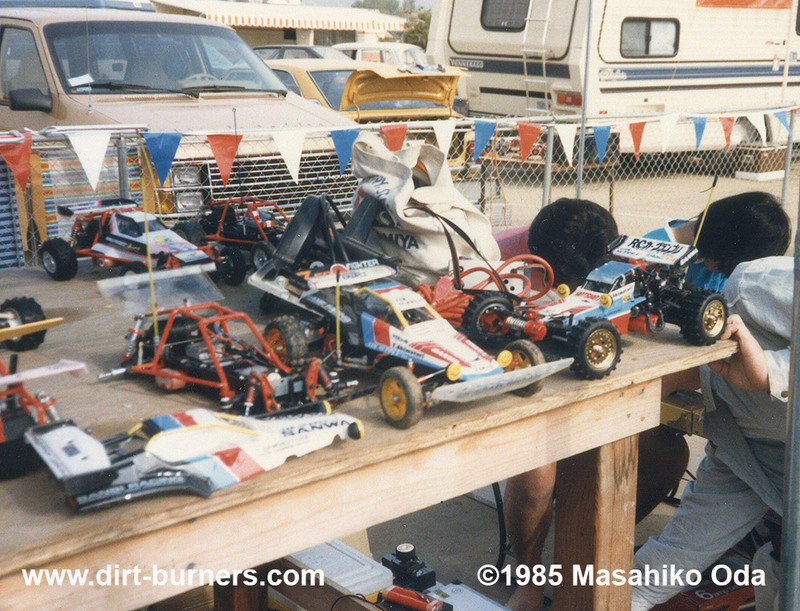 Kyoshos Shigeru Hino working on his cars, the Tomahawk and his own design, the Gallop 4WDS. 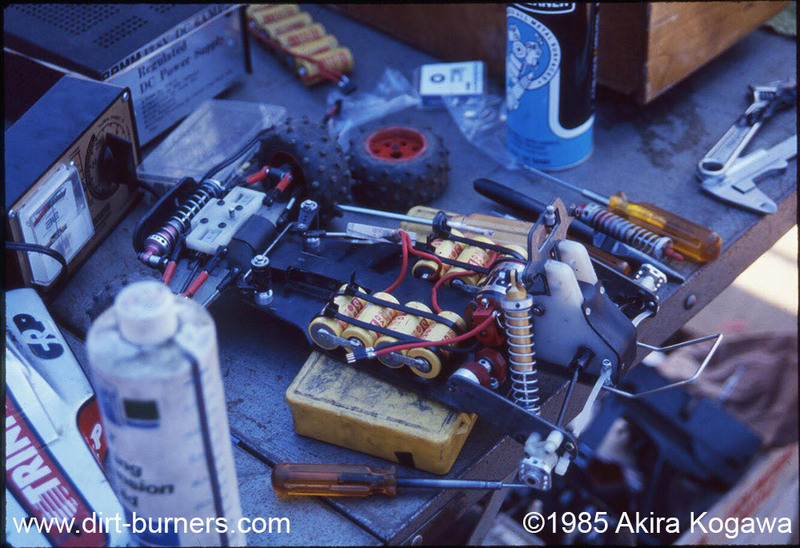 Two years later, at the 1987 WC im Romsey (England), things were very different, with Auto Model and Kogawa being in charge of it all, very much dominating both the (now separated) 2wd and 4wd classes. 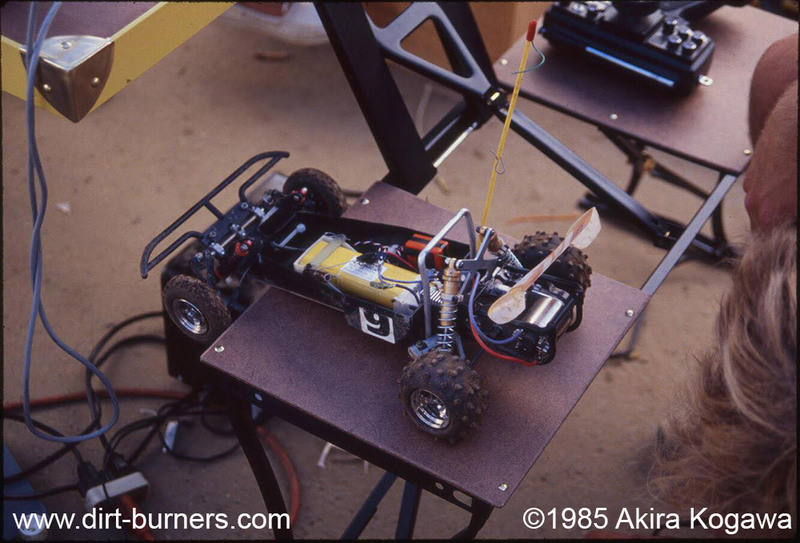 Auto Model has been leading the 1/10 off-road competitive buggy development for Kyosho ever since. Well, with a small “hiccup” you can read about here. 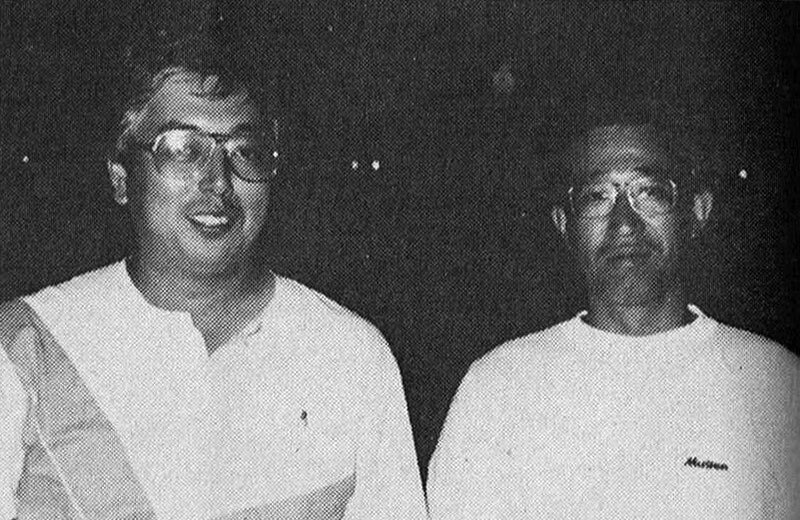 In 1988 Kogawa decided to join his good friend Tatsuro Watanabe at his newly started company HPI (Hobby Products International). 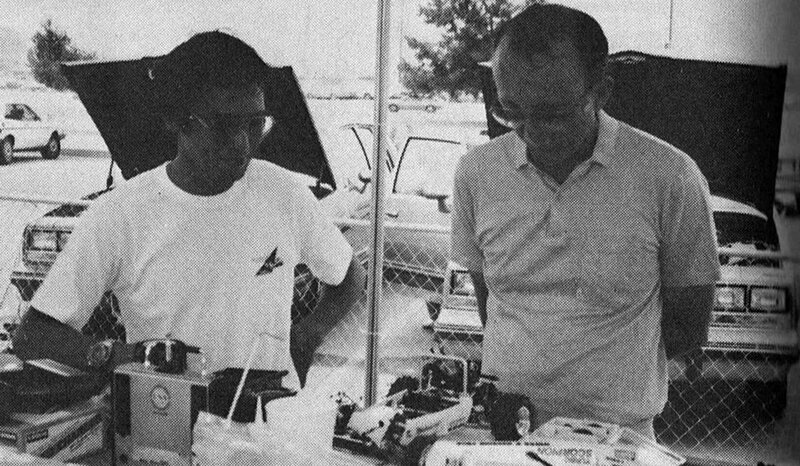 Kyoshos Kazuhiko Nakanishi and motor maestro Mike Reedy admiring the Kyosho Scorpion. Nakanishi was the highest ranking Japanese driver in the “Stock” class, finishing in 27th place. 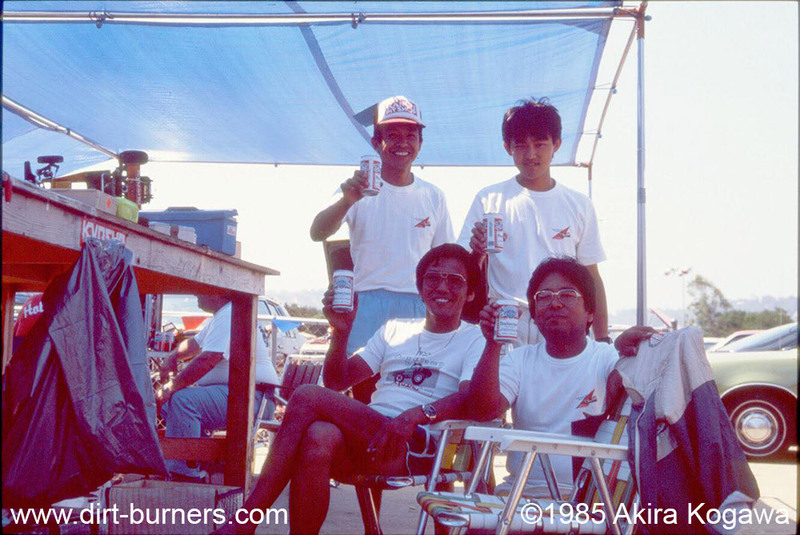 In addition to the designers Hino (Stock: Tomahawk/Modified: Gallop) and Kogawa (Tomahawk/Tomahawk), the rest of the Kyosho team of drivers were Hidetoshi Nagamine (Turbo Scorpion/Turbo Scorpion), Masatoshi Kobayashi (Turbo Scorpion/Turbo Scorpion), Kazuhiko Nakanishi (Scorpion/Scorpion), Toshifumi Watanabe (Scorpion/Gallop) and Yoshiaki Fujita (Scorpion/Dyna SRB). 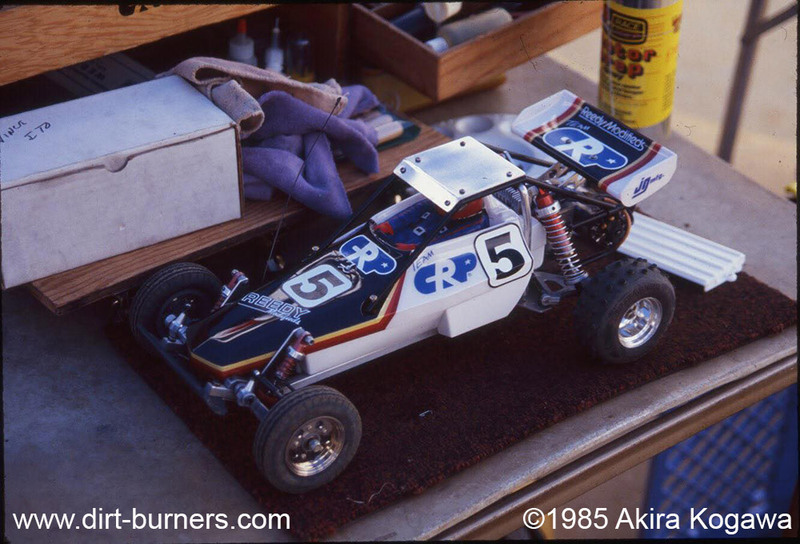 Although being a part of the Kyosho team, Fujita ran a Dyna Models modified Tamiya SRB in the “Modified” class, instead of the Gallop. The Kyosho team charging batteries and running in the hand-out stock motors. 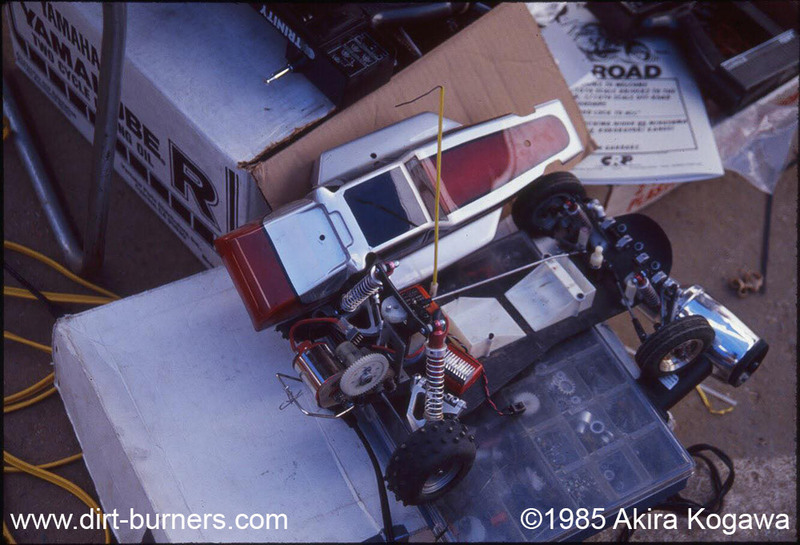 While Kyosho were putting themselves in the shadows at the 1985 Worlds, there were others that used the opportunity to show off their new developments. 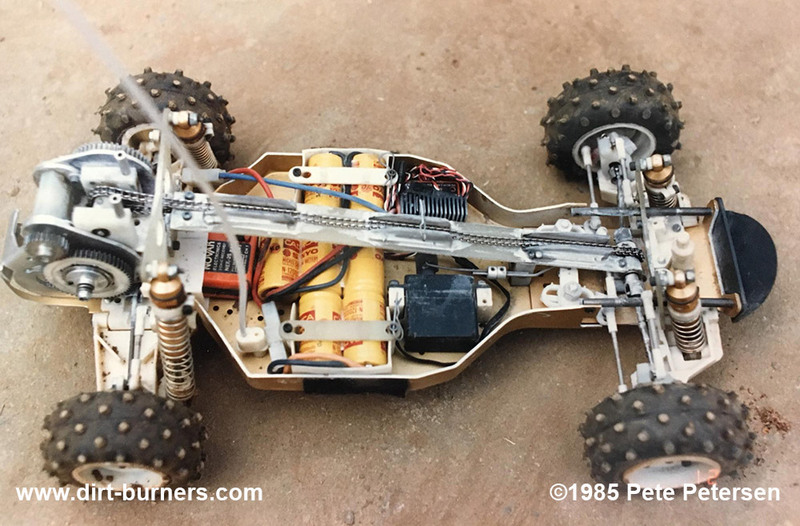 The Associated team had been working on improving their revolutionary RC10 buggy for over a year now, and it was the weapon of choice for many drivers with ambitions. All the variations of the RC10 were good examples of the ingenuity seen in the SoCal area at the time, with people and hop-up brands making loads of new parts for the car at a daily basis. 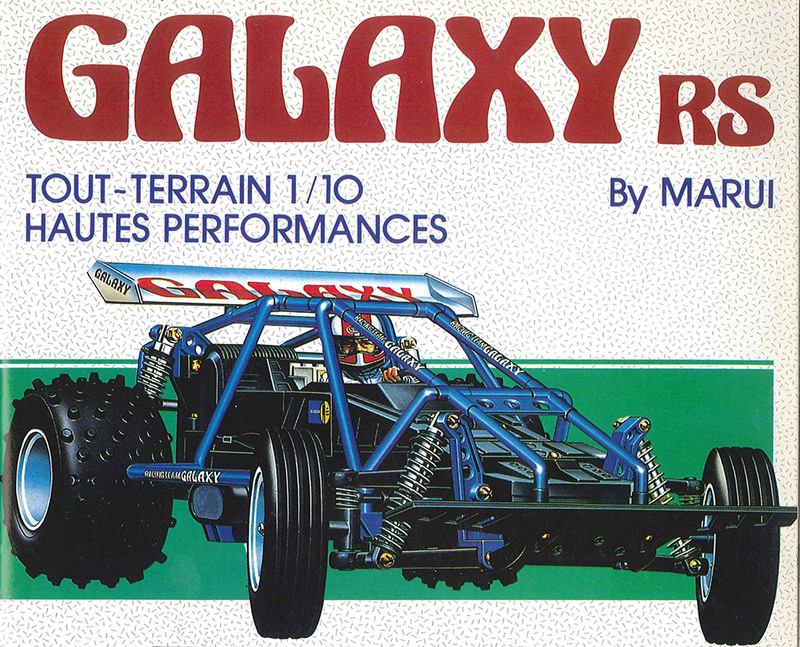 Very much like they had embraced the Tamiya SRB’s few years earlier. This was to be the first Worlds title for the RC10, the first of many. 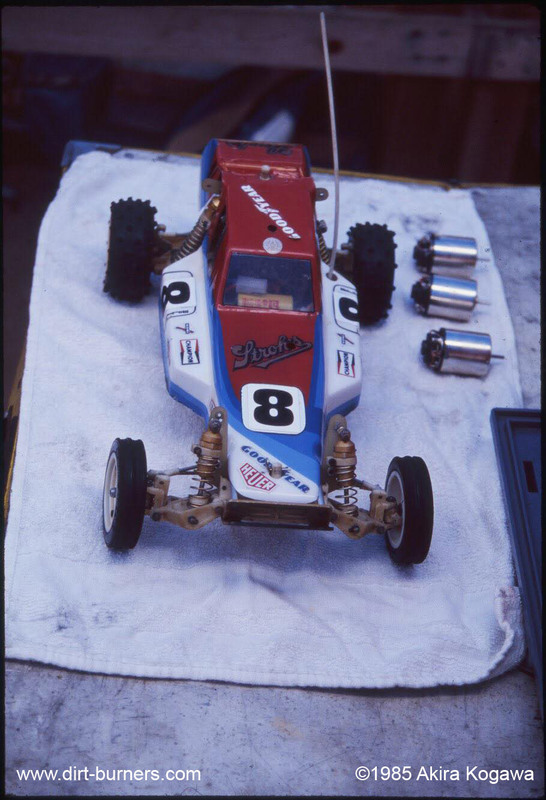 Associated also had a 4wd prototype ready, that came second in the “Modified” class, both in the hands of Jammin’ Jay Halsey. 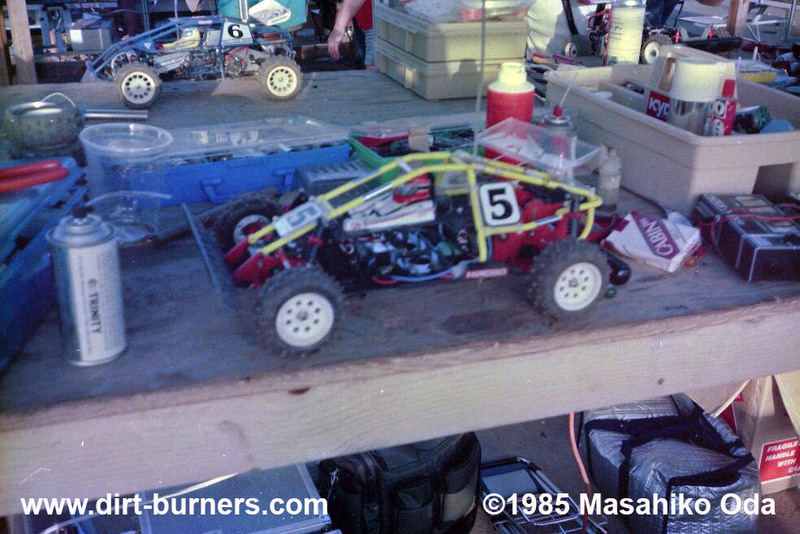 Eustace Moore and his company MIP also had their own take on a 4wd RC10 ready for the “Modified” class. 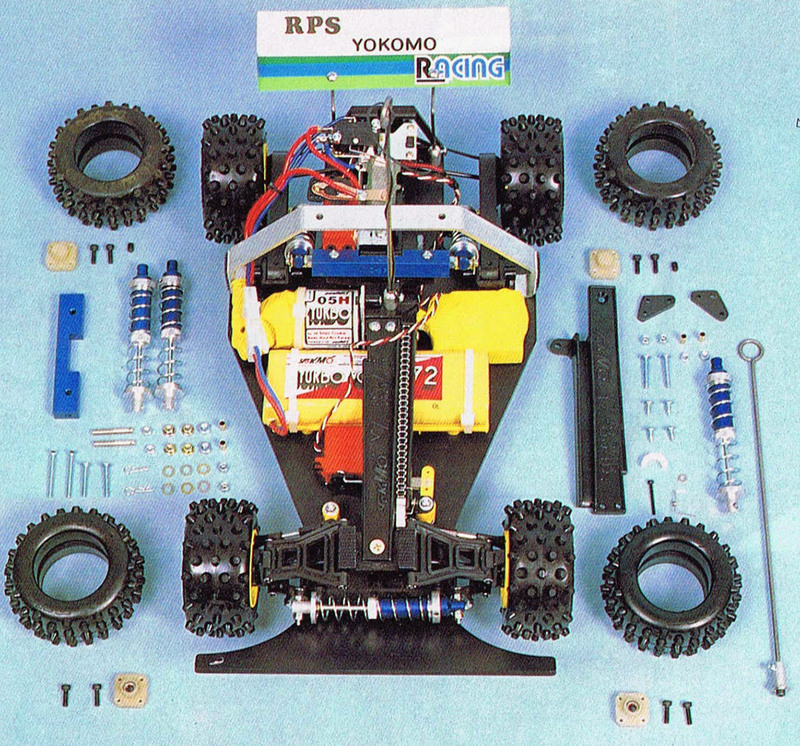 Losis own brand RPS (Ranch Pit Shop) had teamed up with Japanese Yokomo to further develop the Yokomo YZ-834B Dog Fighter 4wd buggy, released a while back. Yes, the 834 in “YZ-834B” means it was the design of the 4th month of 1983, but I’m not 100% sure of it’s actual release date. 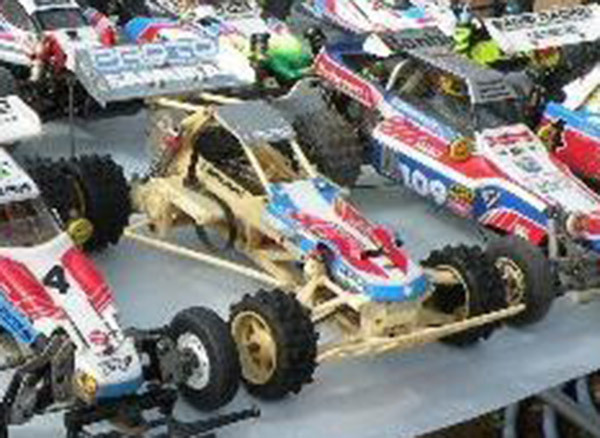 The Dog Fighter had proved very capable and successful, and while other brands had heaps of new 4wd models released or ready to be released, the “old Dog” was still to hold its own for a few years (until the release of the 870C), due to the Losi/Yokomo connection. Marui were also present with a pool of drivers put together by the Proto design team, sponsored by Air Supply. The team consisted of the designers Tadashi Kurihara (Stock: Galaxy/Modified: Samurai), Hiroshi Nakamura (RC10/Samurai), and quite a few other prominent figures in the Japanese RC industry, like Air Supply owner Tetsuji Okamura (Galaxy/Samurai), RC magazine journalist Hiroshi Ohide (Galaxy/Samurai), and the to-be HPI founder/owner and former AYK employee Tatsuro Watanabe (Galaxy or Hunter/Samurai). My sources are split on which car Watanabe used in “Stock”, as Nakamura thinks it was the Galaxy, but Watanabe himself believes it was a Hunter. Well, they’re basically the same cars anyway, and whether it was the Galaxy or the Hunter, Tatsuro Watanabe did best of the Marui drivers in the “Stock” class, finishing 3rd in the G-Main, meaning he placed 63rd in total, just in front of his Kyosho namesake Toshifumi Watanabe and his Kyosho Tomahawk. The Marui Galaxy. Who would have guessed this to be a Worlds car? While the standard team car for the “stock” class was the Marui Galaxy, the Proto/Air Supply/Marui team were putting a newly developed car, that would later be known as the Marui Samurai, through it’s pases in the Modified class. 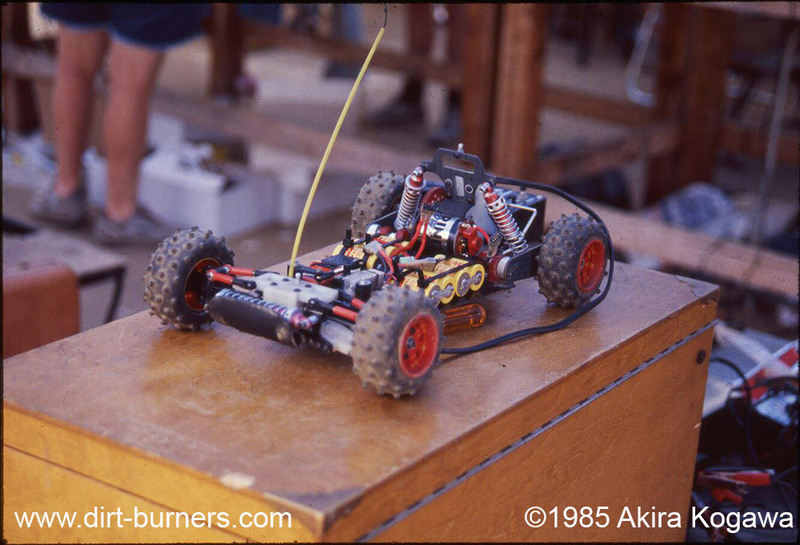 Compared to where Kyosho where with their Optima at the time, the Samurai was in a much earlier stage of development. Mechanical designer Hiroshi Nakamura wouldn’t even describe it as a prototype, but rather a pre-prototype concept car. 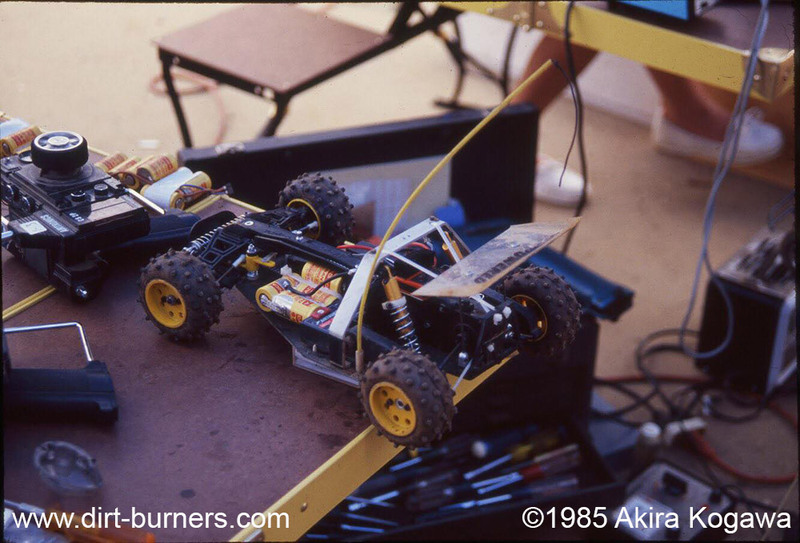 One of the Samurai prototypes used at the 85 Worlds. Sorry for the bad image quality, but I’ve been searching for good pictures of one of these cars for a long time, without any success. This picture is not from the 85 Worlds, but taken at a later time. This Samurai prototype was owned by Yoshiaki “Kemur” Shimotori who was not a part of the Proto/Air Supply/Marui team, and he got his hands on this after the Worlds, from being a friend of designer and Proto owner Kurihara. This is believed to be the only of the 1985 Worlds Samurais still in existence, although its whereabouts are unknown after the passing of Y. Shimotori a couple of years ago. It’s thought to be in the hands of the “Y. Shimotori Memorial Driving Association”, a group of his friends, keeping his spirit alive. If anyone from Japan is reading this and are able to search up and contact the club to help me with some better photos, please do so. Please. Pretty please….. CORRECTION: It seems this “White Samurai” is not one of the concept prototypes from the 85 Worlds, but rather a pre-production model that was molded in white from the production molds. I still would like some better photos of it, though…..
Slightly resembling the Kyosho Gallop (Kurihara, the exterior designer, came from a job at Kyosho), but without the four wheel steering. The Samurai concept prototypes were partly hand made and parts were manually casted from polyurethane resin. Although looking really nice, Hiroshi Nakamura, the mechanical designer of the buggy, told me: “The real challenge was to make the cars hold together for even one single run”. 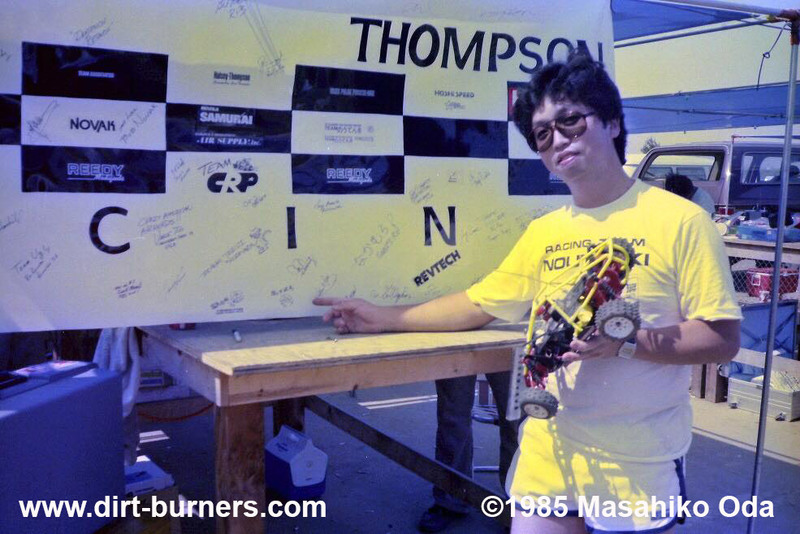 Designer and Proto owner Tadashi Kurihara was the one who did best with the Samurai, finishing 84th, after ending 4th in the I-Mains, two places behind Kyosho designer Akira Kogawa and his Tomahawk, and just in front of Yoshiaki Shimotori and his Tamiya Hotshot. 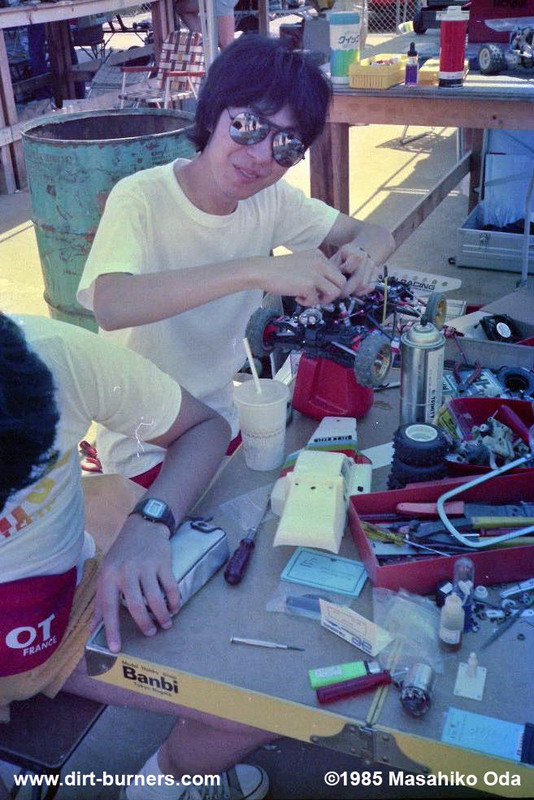 In my search for good pictures of this pre prototype Samurai, Tatsuro Watanabe, one of the team drivers, could tell me that they all had to hand in their cars to Proto after the event. Ironically, several of the drivers on the team, bought RC10’s from the shop at the “Ranch”, actually so many that the shop ran out of stock. At least that’s what the legend says. 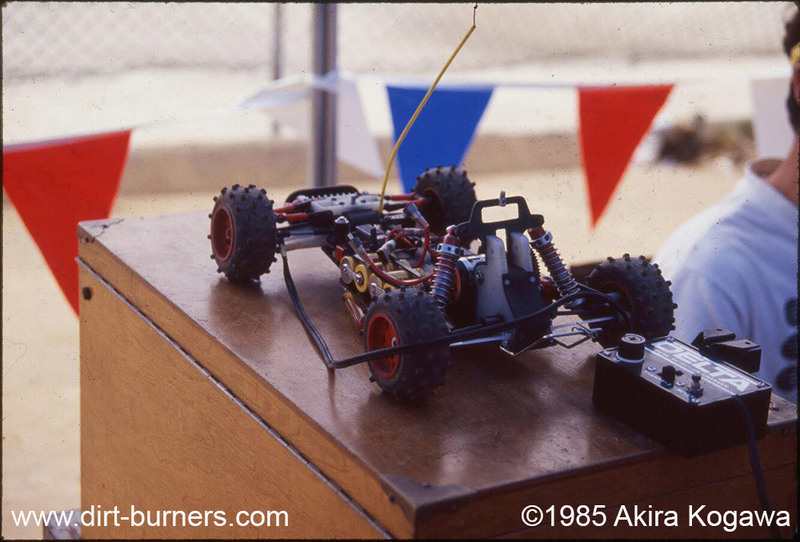 I have, however, only managed to get confirmed that one person, Hiroshi Nakamura, bought a RC10. A car he used in the Stock race, where he finished in 69th place. 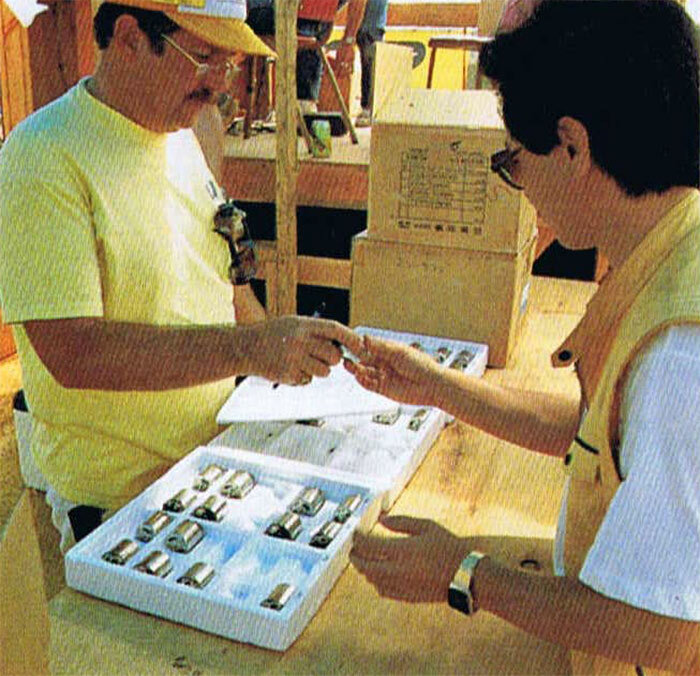 The Proto/Air Supply/Marui team hard at work on their Samurai concept prototypes, with the designers Tadashi Kurihara and Hiroshi Nakamura closest to the camera, Tatsuro Watanabe sitting facing the camera and Hiroshi Ohide standing in the background. Notice the RC10 box under the bench…. 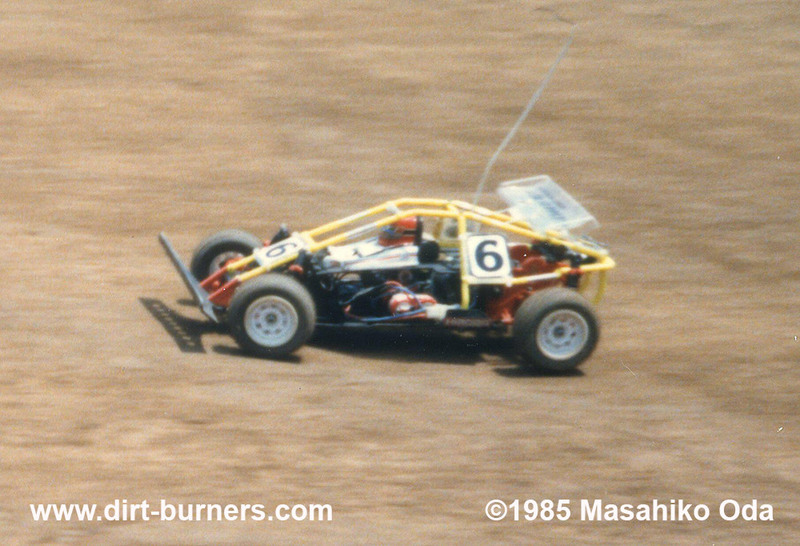 Marui never sent a team to a Worlds again, and decided to focus on the “basher” market instead, although the Proto design team wanted to keep developing buggies for racing. 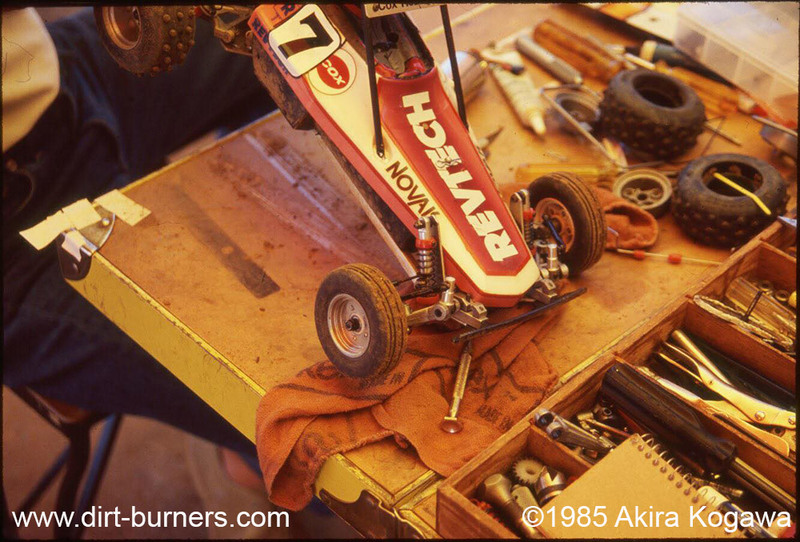 Nakamura decided to go on his own regarding race buggies, and we all remember his “Nakamura SPL” from the 1987 Worlds. 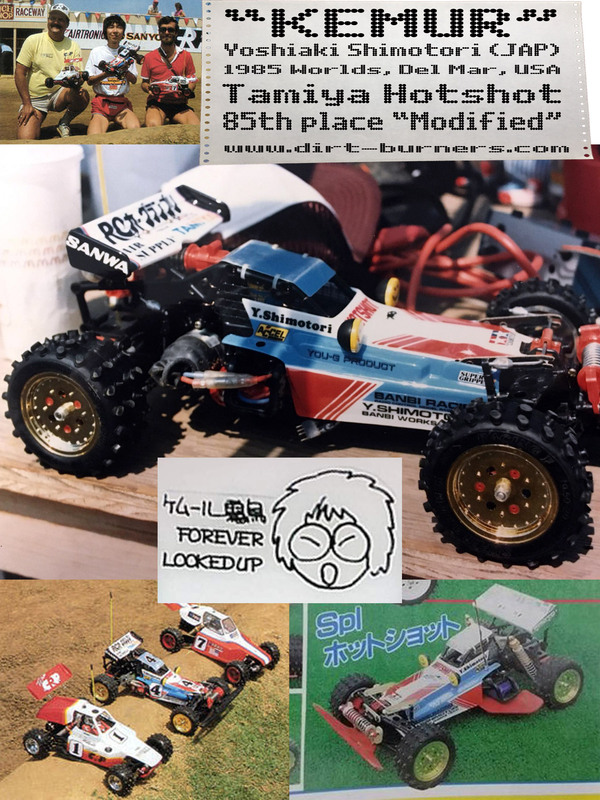 Another Japanese company that sent a team was Mugen, with Takashi Aizawa and Keiichi Kikuchi running their newly designed all wheel drive and steering Bulldog buggy in the Modified class. They did not compete in Stock. 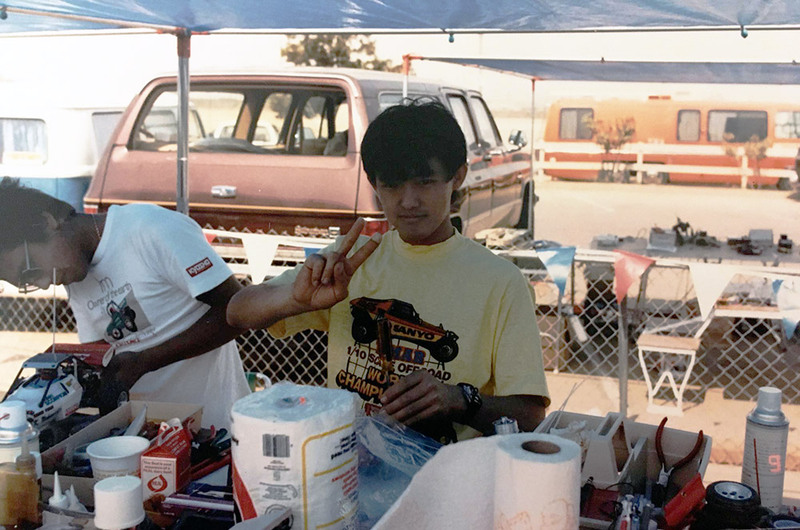 Aizawa ended 2nd in the Modified C-Main, placing him 22nd overall in the class, which was the best result for any of the Japanese drivers in either of the two classes. Kikuchi won the I-Main, giving him a 81st place. 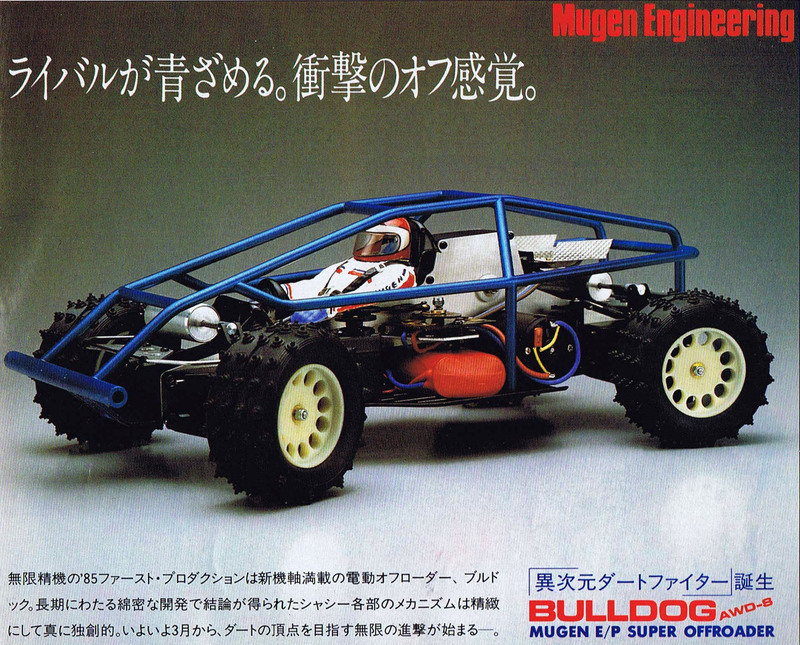 The Mugen Bulldog AWD-S buggy. You can watch Aizawa in the Modified C-Main in this video. Also notice that Allen Losi, the skating brother of Gil Jr finished as number 7 in the C-main, placing him 27th overall. Shoji Murayama, the leader of the Japanese delegation, and JMRCA director Mr. Tada. Tamiya was also attending, although not in an official capacity, but represented by the rather eccentric Yoshiaki “Kemur” Shimotori, running a Tamiya Hornet and their brand new Hotshot for a team called “Racing Team Noutenki”. 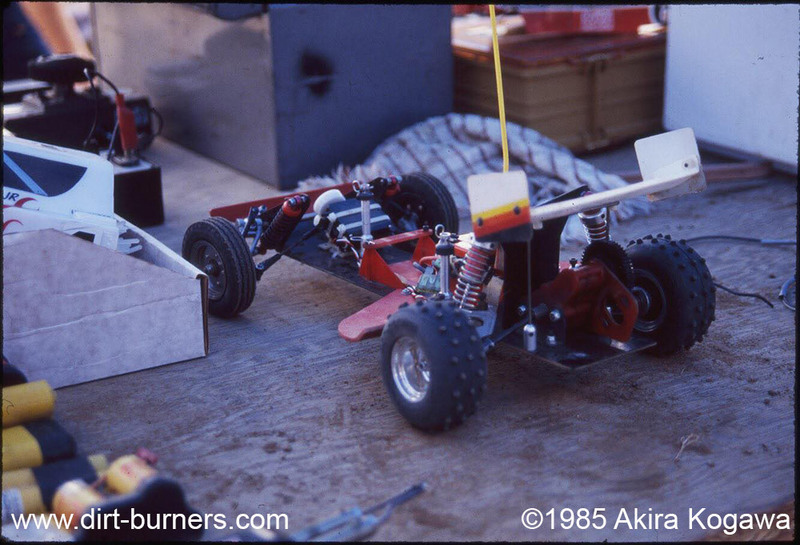 Masahiko Oda also raced for the same team, but used a Kyosho Tomahawk and a Hirobo Zerda. The Japanese word “Noutenki” could best be translated as “carefree” or “happy-go-lucky”, a very fitting name that described the great Y. Shimotori perfectly! There were a couple of other MRC/Tamiya (Tamiya’s US representatives) drivers in place, running the new Hotshot, but at the moment I don’t know who they were. Shimotori’s Hornet was heavily modified, with a totally redesigned front end, and a complete rear end and gear box from the Hotshot. One could of course argue if it still should be called a “Hornet”. “Kemur” Shimotoris heavily modified Tamiya Hornet. The Hotshot he brought, released just a couple of months earlier, was bone stock out of the box when he arrived in the US, with the original very early edition only gold wheels* and those cool looking mono shocks, but really did nothing in terms of dampening. Of course it had his “trade mark” red/white/blue paint scheme. But teaming up with John Gudvangen of JG Mfg. they modified the Hotshot a lot, and the car he brought back home to Japan was very different from the factory stock Hotshot he left with. Shimotori finished 88th in “stock” with the Hornet and 85th in “Modified” with the Hotshot, while Oda finished 94th in “Stock” with the Tomahawk, and 62nd in “Modified” with his Zerda. 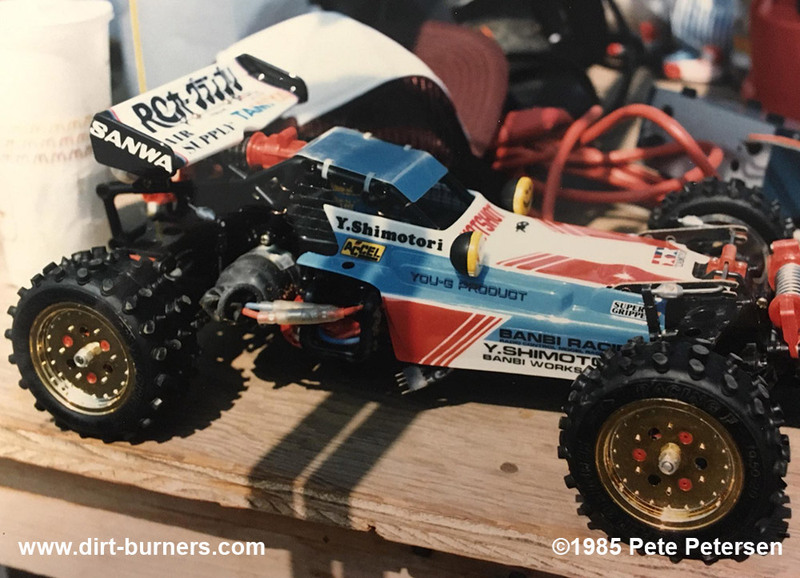 Y. Shimotoris Tamiya Hotshot from the 85 Worlds. The lower right picture is how it looked like after teaming up with John Gudvangen of JG Mfg. 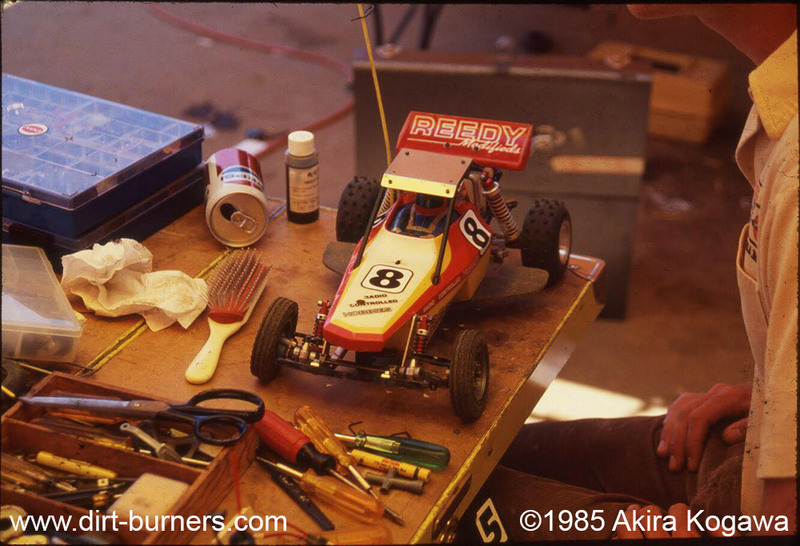 So keep in mind that many of the JG parts you have on your Hotshot sitting on your shelf, were designed by Gudvangen and “Kemur” Shimotori at the Ranch Pit Shop in Del Mar, during the week leading up to the 1985 Worlds! Although falling through in the race, “Kemur” won second place in the “Modified” concours competition with his Hotshot, behind Herb Hanss. The “Stock” concours winners to the left, and the “Modified” concours winners to the right. The track was set up with a new high tech AMB electronic lap counting system that mostly worked great. I believe the system was brought down to Del Mar from the other “The Ranch Pit Shop” in Pomona, a couple of hours drive away. The AMB electronic timing system. There were however some drivers, with a certain combination of transponders and radio equipment (transponder #10 and Sanwa/Airtronics FM radios on the orange frequenzy), who experienced interference from the timing system every time they passed the scoring bridge. Most of the problems were fixed by positioning the transponders and motor/speed controller as far away from each other as possible, and using three capacitors on the motors, positive to can, negative to can and the third between positive and negative. The timing bridge that caused problems for some drivers. There were two classes, “Stock” and “Modified”. The “Stock” class was restricted to 7.2v batteries and stock hand-out motors. 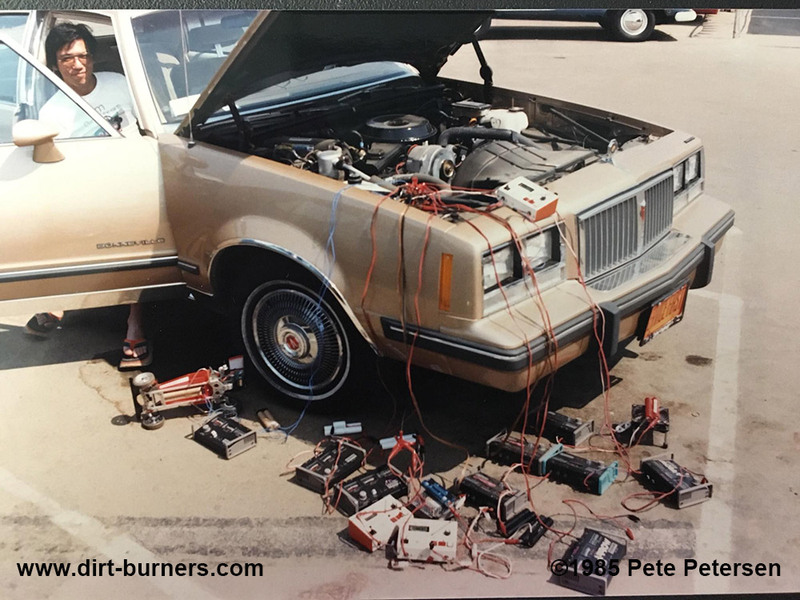 In the “Modified” class almost anything was allowed, like 8.4v batteries and tuned motors. The hand-out of the stock motors being administrated. First out was the “Stock” class where Gil Losi Jr. was TQ, followed by Tony Neisinger, Kris Moore, Gary Kyes, Mike Dunn, Jay Halsey, Mike Giem, Paul Dionne, Eustace Moore and Jerry Case. There were no bump-ups in the finals and the A-Main was run as a best two out of three system. The three legs were spread out between the lower finals on Thursday, and in the A-1 Jay Halsey really found the speed, and clocked his first 20 lap run. In A-2 Halsey did another 20 lap race, this time even faster, actually the fastest run of the Stock class, all week. These two very fast races meant that Halsey could ignore his second place in the A-3, as his two wins were fast enough to grant him the title “1985 Stock World Champion”. TQ Gil Losi Jr. raced to silver and Tony Neisinger won the bronze. Following them were Giem, E. Moore, K. Moore, Kyes, Dionne, Case and Dunn. Unfortunately I haven’t been able to find any videos from the Stock class. On Friday the qualifying rounds for the “Modified” class started. 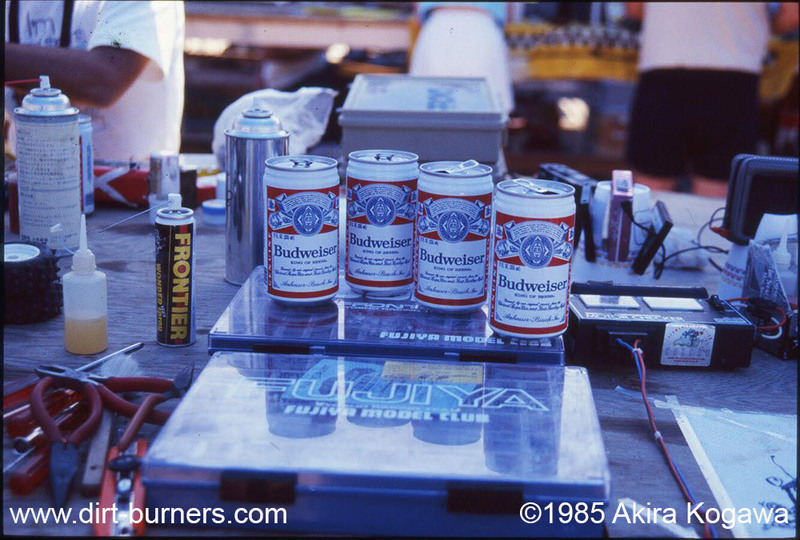 While 20 lap runs were for the few top racers in “Stock”, the hotter motors, 8.4v batteries, 4wd etc. made 20 lap runs the order of the day in “Modified”. Once again Gil Losi Jr. was TQ, running his Trinity powered RPS/Yokomo, with “Stock” World Champion Jay Halsey and his prototype 4wd RC10 in second position. Eric Soderquist were third, followed by Mike Dunn, Chris Allec, Mike Giem, Paul Dionne, Gary Kyes, Glenn Glass and Eustace Moore. With just a few exeptions, very much the same field as in the “Stock” competition. The ten top qualifiers in “Modified” were much closer than in the “Stock” competition, with only 7 seconds dividing the ten racers. Like in the “Stock” class, the A-Main was a best two of three runs system, and all three legs were run on Sunday, the last day of the event. In A-1 Gil Losi Jr. continued his great racing from the qualifiers, and won the leg followed by Giem and Kyes. A-2 didn’t go as smooth as A-1 for Losi Jr. as he was passed by Halsey halfway through the race after a glitch that resulted in him ending fifth, after Halsey, Dionne, Allec and Soderquist. This meant that nothing was decided before A-3, the third and last run. The “Modified” World Championship was still up for grabs, with Halsey and Losi Jr. both having good chances for triumph. Losi Jr. took an early lead, while Halsey lagged a bit behind. 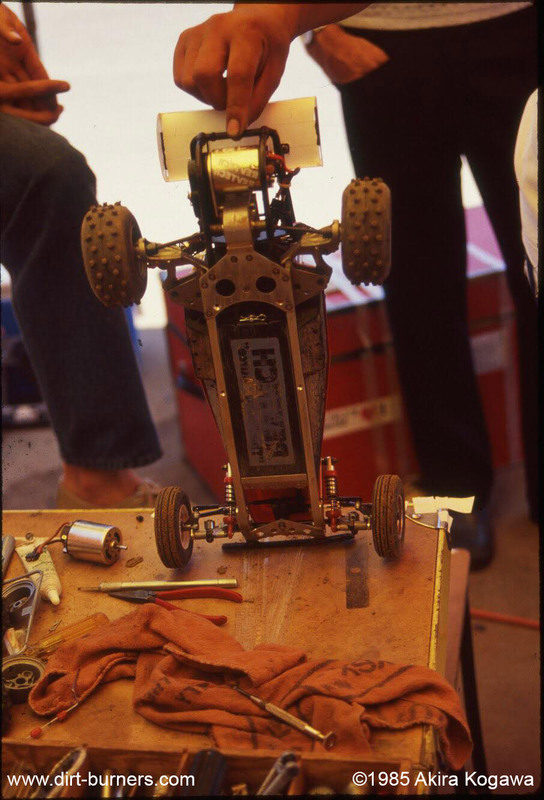 Then Losi’s Yokomo landed on the head after a jump, and before the car was flipped back, Halsey were right back in the game. Halsey followed tight for a couple of laps, and finally found enough room and opportunity to pass. It should’t be for long though. Shortly after they picked up the slower drivers, and Losi did the better job of passing them, leaving Halsey in second again. Losi kept his lead all the way to the finish line, with Halsey following in second and Chris Allec in third. A recount of the laps would however promote Paul Dionne to third, and slipping Allec down to fourth. Giem finished fifth, followed by Soderquist, Glass, Dunn, Moore and Gary Kyes in tenth. 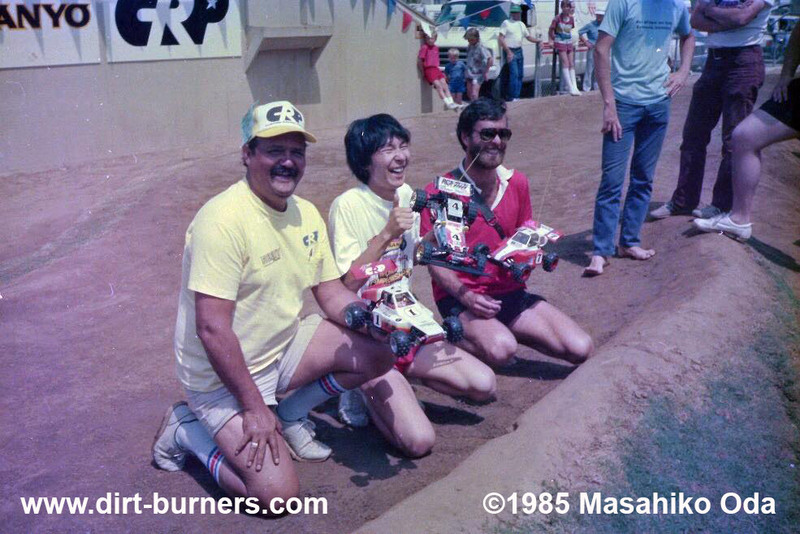 So way back in 1985, these two guys became the first ever official IFMAR World Champions in 1/10 electric off road RC racing! Gil Losi Jr (Modified) and Jammin’ Jay Halsey (Stock) became the first official electric off road World Champions. A rare view of many of the top cars, as well as an interview with the Modified World Champion, Gil Losi Jr, going through his Trinity RPS/Yokomo. Here is Gene Hustings video review of the event. I’m sorry but even if these videos are really informative and great ways of getting the “feel” of the different events, it strikes me that all of Hustings videos sounds more like long Associated commercials than actual race reports. But who knows, that was maybe the point of them? But him saying that Halseys winning RC10 is “box stock, just as it comes out of the box” is not completely true. Had he said something along the lines of “mostly out of the box, just with a few modified parts”, it would be closer to the truth. The magazine article about Jays car that he shows in the video, does not even show the actual RC10 that Jay used. Just compare it to the one on the pictures further up, where both the chassis and the motor guard have been milled etc. Husting also shows a picture of Tatsuro Watanabe and Hiroshi Nakamura working on a RC10, and he says they both bought RC10’s and improved their lap times by two rounds. While Nakamura told me it was correct regarding him buying a RC10, Watanabe said he used a Marui. But anyway, the video has some great still-photos from the event, and well worth a watch! Where there’s life… there’s Bud. 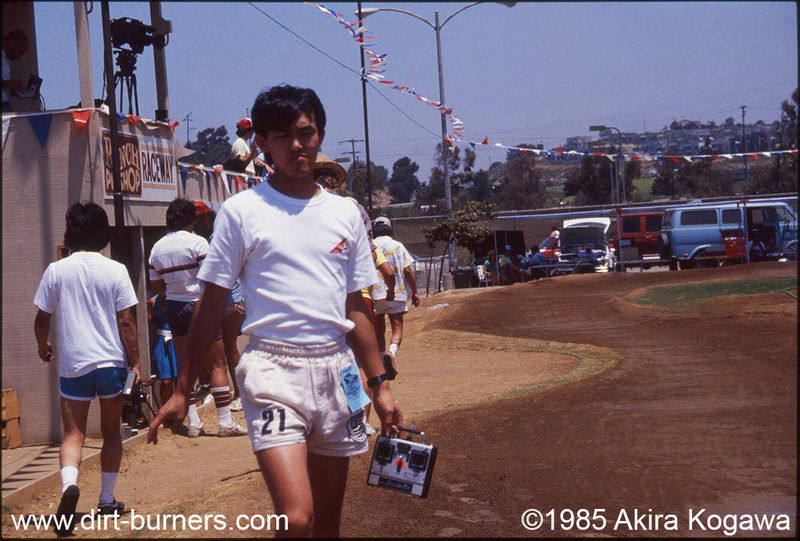 Akira Kogawa walking back to the pits from the drivers stand. Doesn’t look too happy with that run…. 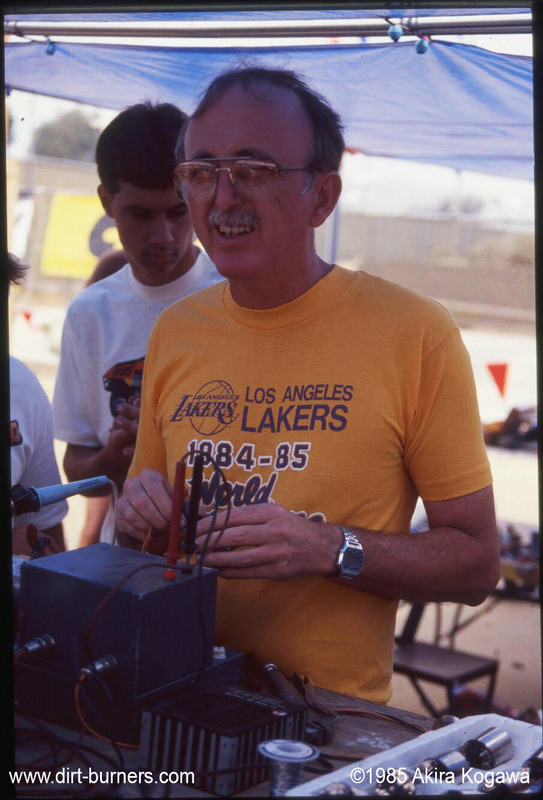 The magic motor man Mike Reedy. Akira Kogawa in the pit. Chris Allec’s Hirobo/Yokomo hybrid that he finished 4th with in the “Modified” class. Car #8 is Toshifumi Watanabes Kyosho Tomahawk that finished 64th in the “Stock” class. The pink and grey stripes on the sides looks suspiciously like those on Joel Johnsons 1987 World Champion Ultima. Coincidence? Car #5 I’m not sure about. It features a “Dyna” (Dyna Models) sticker under the side window, right in front of the #5 sticker. 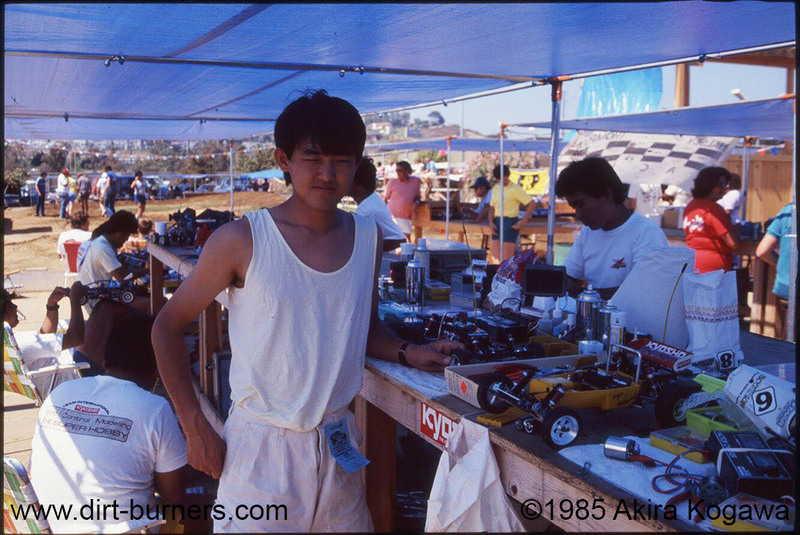 Yoshiaki Fujita, a well known Team Dyna Models driver did race, but in the Team Japan picture further up on the page he is holding two cars that does not look like this. 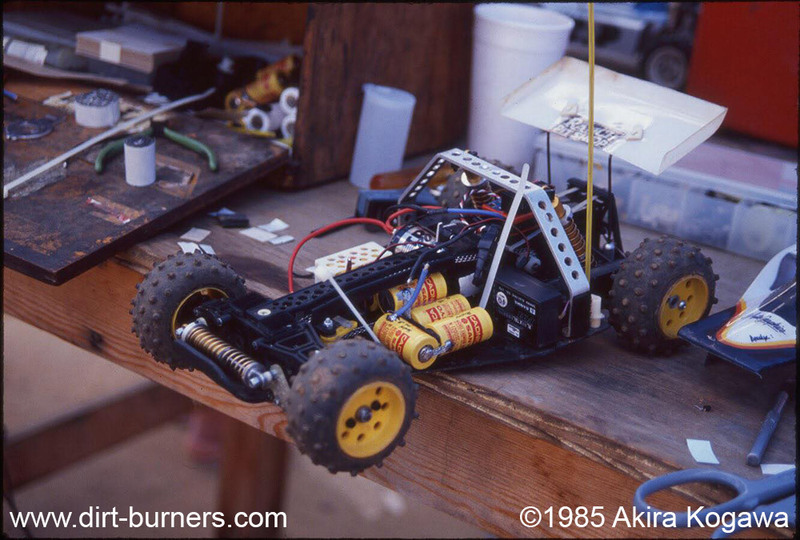 Jay Halsey’s 4WD Associated RC10 prototype. Runner-up in the “Modified” class. A Yokomo Dog Fighter with a huge Kyosho sticker????? 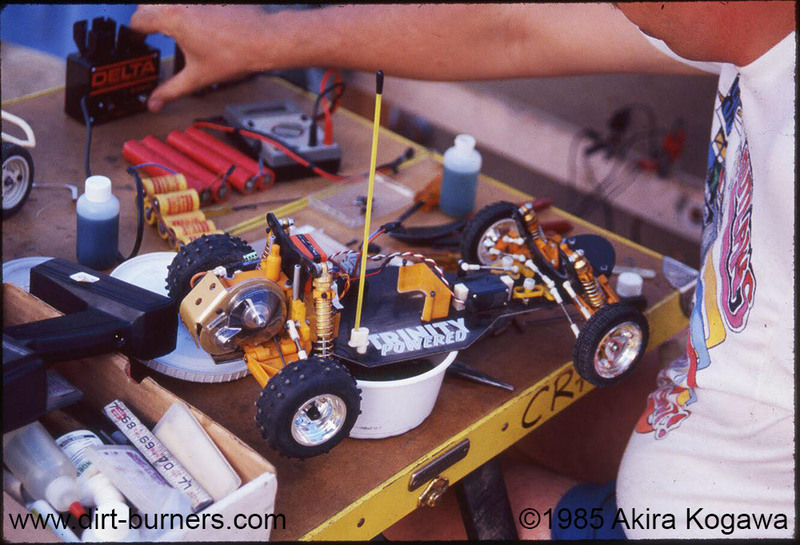 Gil Losi Jr’s “Modified” World Champion RPS/Yokomo. The Yokomo of Gary Kyes that ended 10th in the “Modified” class. Yoshiaki “Kemur” Shimotoris Hotshot that finished 85th in the “Modified” class. The Kyosho team hard at work. Kazuhiko Nakanishi charging the batteries. Kazuhiko Nakanishi and Akira Kogawa in the pit. 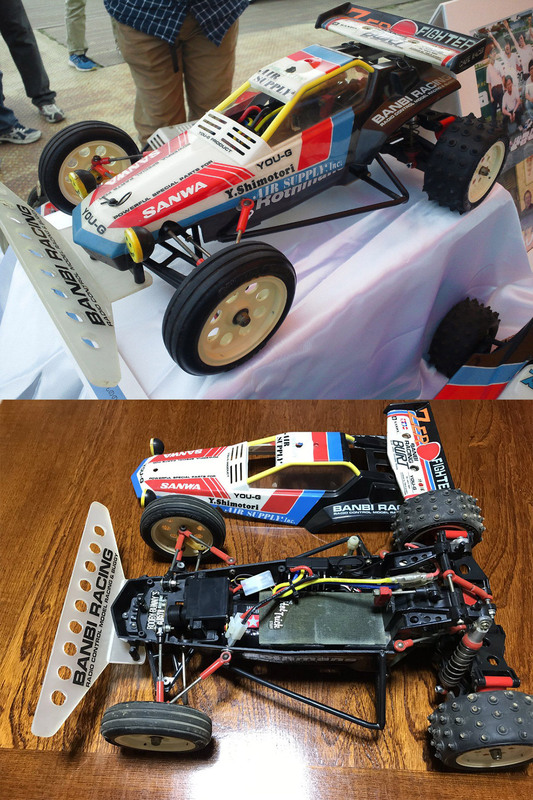 Jay Halseys 4wd RC10 prototype. The “Concours” winners of the “Modified” class. The winner Herb Hanss to the left, runner-up Yoshiaki “Kemur” Shimotori in the middle and bronze medallist Larry Grant to the right. 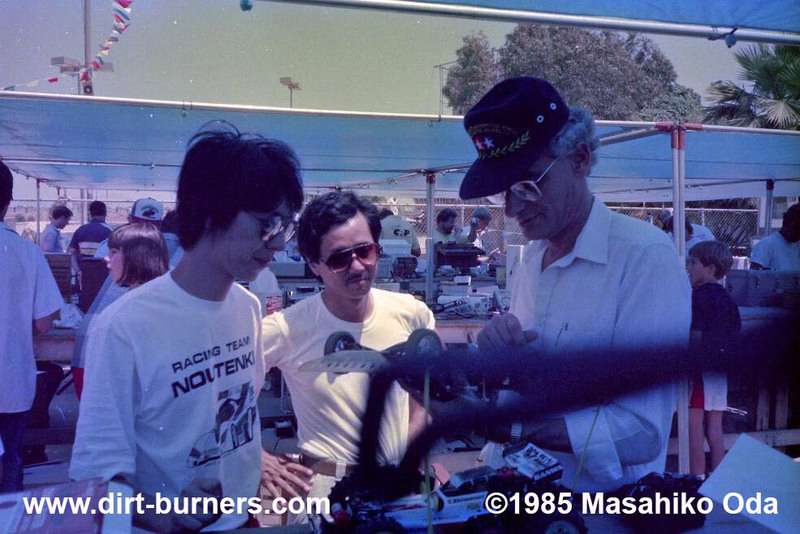 Yoshiaki “Kemur” Shimotori and Tetsuji Okamura (owner of Air Supply) having a discussion with another legend, John Thorp. Yoshiaki “Kemur” Shimotori working on his very special Hornet. Masahiko Odas Hirobo Zerda on the track. Yoshiaki “Kemur” Shimotoris Tamiya Hornet and Hotshot. Yoshiaki “Kemur” Shimotori on the bus. Notice the JG Mfg. cap. 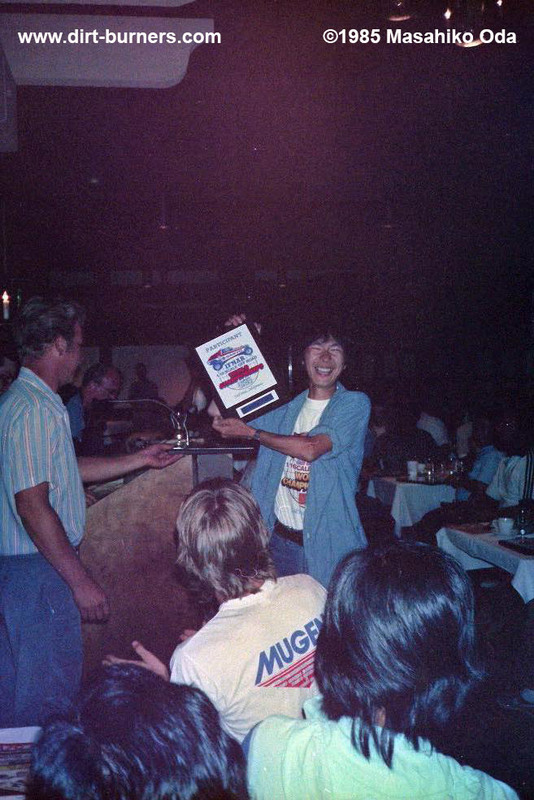 Yoshiaki “Kemur” Shimotori at the awards ceremony. Yoshiaki “Kemur” Shimotori admiring one of the Marui Samurai concept/prototypes. IF YOU HAVE ANY OTHER MAGAZINES WITH REPORTS FROM THIS RACE, PLEASE CONTACT ME AS I’M VERY INTERESTED IN GETTING MY HANDS ON GOOD SCANS OF THOSE FOR THE DOCUMENT DEPOSITORY. PLEASE LEAVE A COMMENT BELOW IF YOU CAN HELP! I’M IN PARTICULAR LOOKING FOR THE ARTICLE IN THE DECEMBER 1985 EDITION OF RCM (RADIO CONTROL MODELER) BY GENE HUSTING. If you were in Del Mar at the Worlds, and maybe even have your own photos from the event, please leave me a note in the comments section below. I would love to hear what you have to say, and I will add additional photos below the article if you would like to help preserving the history. The sources here are many, so many that I’m a bit afraid of mentioning anyone in fear of forgetting someone, but if you feel you should be listed, please shout! Obviously the reports in RC magazines and various websites have been great sources, as has people like Akira Kogawa, Hiroshi Nakamura, Tatsuro Watanabe and of course Mike Haswell and Dan Yurek for their many scans of vintage magazines and articles. Kent Clausen…. Thank you for helping me finding the location of that old Del Mar track. That was some sweet work you did there finding those old aerial photos! Pete Petersen, thank you for letting me use your pictures, I love them. 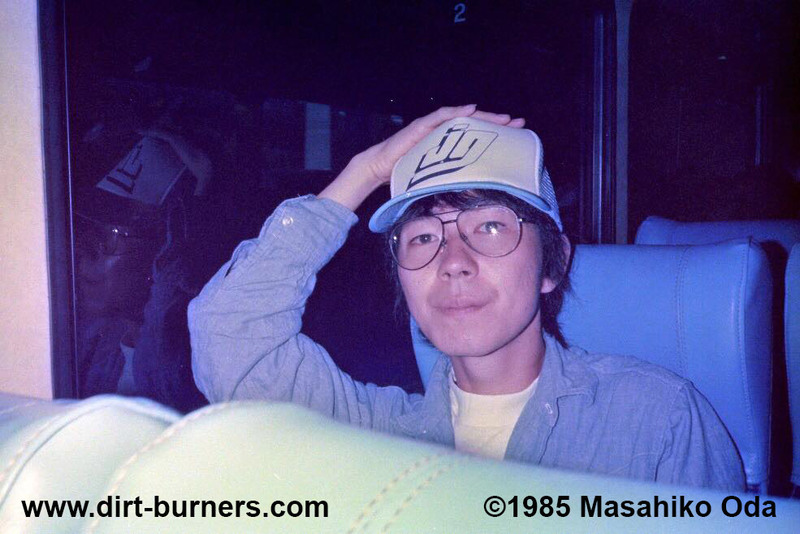 Masahiko Oda, thank you for digging out those great old photos! I would also extend a big thank you to Shin Kumada who kindly keeps helping me translate from Japanese to English. One thing you might have noticed is the weighting towards the Japanese teams and drivers in this article. This has mostly to do with two factors. The first is that the race reports from the Japanese magazines are much more comprehensive than those from the American and European magazines that I have, and they, of course, focus more on the Japanese participants. The second reason is that the Japanese drivers and team members, despite the obvious language barrier, seem much more willing to help when I ask them specifics about their cars, their teams and their experiences. The lengths people like Akira Kogawa and Hiroshi Nakamura have gone to help me (over a long period of time) are quite amazing, it’s really more than anyone could ask. But it also shows that they’re very proud of what they have been parts of, and want to help keeping it from being forgotten. I also received a lot of help from the British drivers when I earlier was researching the 87 Worlds, with people contacting old friends and colleagues all over the place to get me pictures, stories, quotes etc. Although there are exceptions, it has been surprisingly quiet from many of the US drivers when I have tried asking them things, mostly answering with a word or two, if bothering to answer at all. I think that is sad, as I believe they deserve a much bigger place in an article like this. After all they were very dominant in both classes. But the hard facts are that I can’t work with anything but the sources and material I have, and there is not much I can do about it. Believe me I have tried. Tom I just want to thank you for taking the initiative to document and write these articles. I’m sure it’s taken a lot of time and work. I must honestly say that I’m enjoying this as much as anyone. Digging a bit deeper into these events clears up many things I’ve been wondering about, connects dots and helps me seeing the lines in the development of 1/10 racing, the cars and of course the people involved. I have so much fun doing it, and learning a lot along the way. Next up is the 89 Worlds in Sydney, and then I’m planning on digging into the US Nationals and European Championships of the 80’s. Very informative and superbly documented, as usual! Being able to discuss these matters with the very persons who participated in these events is simply fantastic and totally unimaginable without social media… Thank you Tom and thanks to all the contribuyors of this article, it really gives me the impression I was there, in Del Mar! Do you have more infos about the motors used in the modified class? Thanks Ryo. I don’t know much about the motor specs, apart from that Kyoshos motor of choice was the 480T, as they couldn’t stay the distance with the 240S or even the 480S. The Proto team used Trix motors from Air Supply, their main sponsor. The top drivers used the top motor brands of the day, like Trinity, Reedy, Revtech etc., but that’s basically all I know. Can’t be done better! Thx so much! Great report, Tom! Many thanks! Fantastic report, Tom. The work you put in that article is amazing. 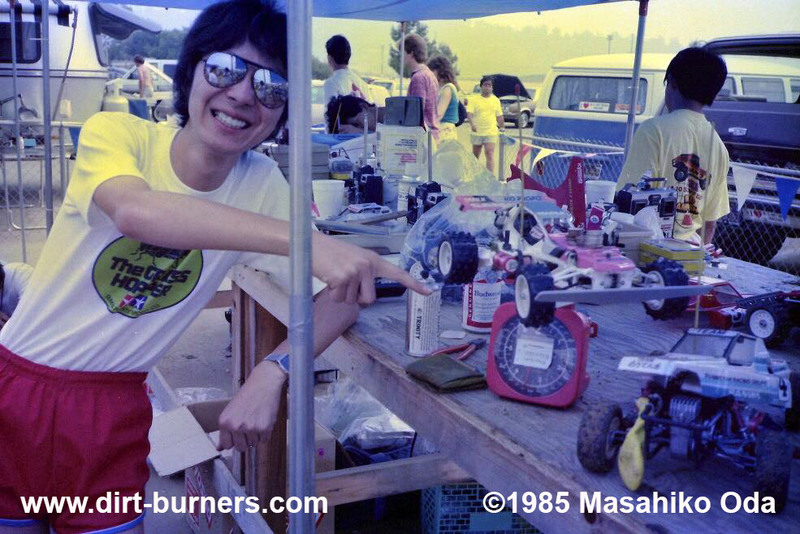 I was a friend of yosihaki shimotori and was an editor of monthly radio controlled car magazine “Super Machine”. His car is managed by a few people including himself. Marui’s samurai is not himself, but other colleagues manage. 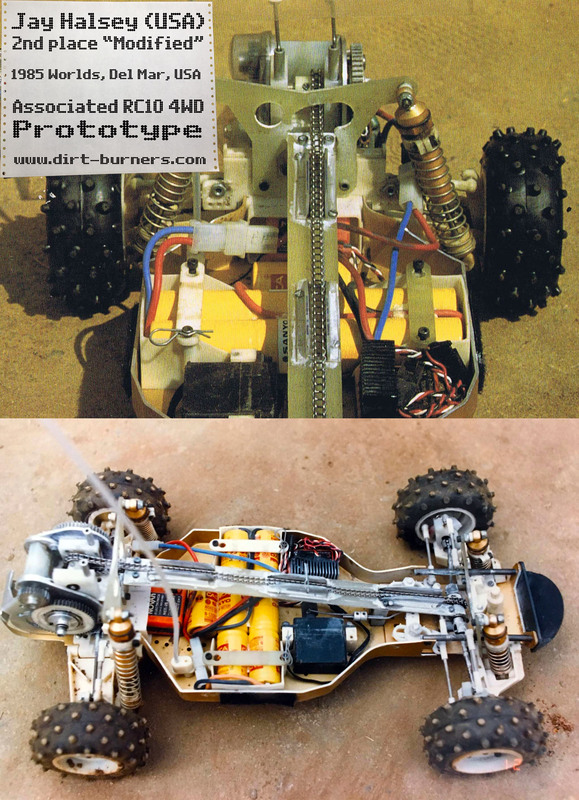 That samurai, it is not a prototype that ran in the world championship in 1985, it is a car assembled with uncolored parts molded for testing from the mold for the product, should not appear in the magazines etc as originally It is an existence. For that reason, since there are few magazines and the like that picked it up, there is no need to know anything other than those who saw the actual thing at the race venue. I am delighted as a friend of him as he speaks hotly in Norway far from Japan like this. That feeling is the same feeling for all of his radio control related friends. I’d like to thank you and I am looking forward to the completion of Tamiya’s Avante, which is currently under construction. Thank you Yanma for the info regarding Kemurs Samurai. So it was not one of the “White Samurai” prototypes, but rather a pre-production model molded in white by Mr. Kurihara. Interesting info, thank you! I don’t know what it is, but Mr. Shimotori seemed like a very nice person, that I would really had liked to know. I admire him and his work a lot. I’m just sad that I didn’t get the chance to know him. I first learnt about him when “researching” Atsuhiro Ohnos Torpedo Optima, and after I started buying old Japanese magazines, his name started showing up “everywhere”. Please say hello to his friends and send them my best wishes from Norway. PS. I will send you an e-mail later on the e-mail address that you provided. There are a couple of things I would like to ask you. I was there and in the video for the C main (far left of drivers stand, also far left in the top photograph). As I recall, I broke during the race and finished in 9th. 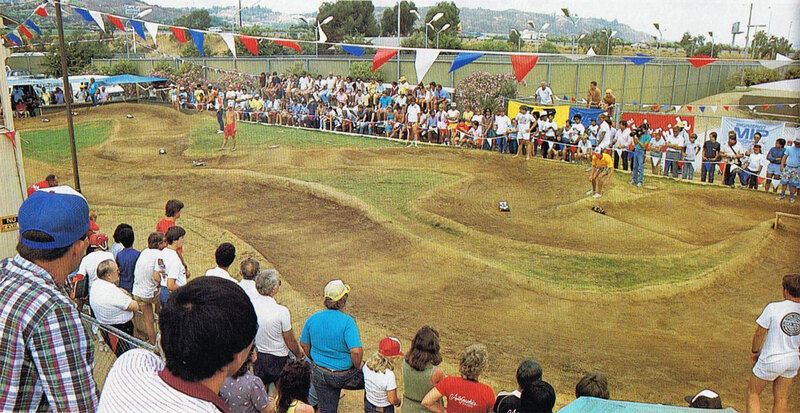 The Ranch Skateboard Park in Colton was the original Ranch RC Racetrack (closed when the Losi’s bought the Pomona track). 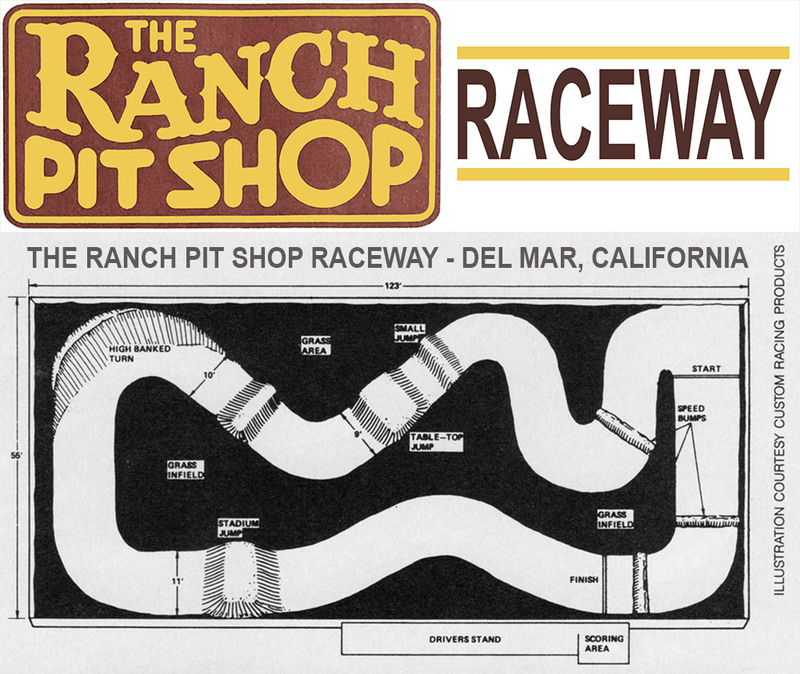 The Ranch Pit Shop in Pomoma was the second (originally Thorp Raceway, then Vehles Pit Shop and finally the Ranch Pit Shop when the Losi’s bought it). The Ranch Pit Shop Del Mar (usually just called Del Mar) was the third. 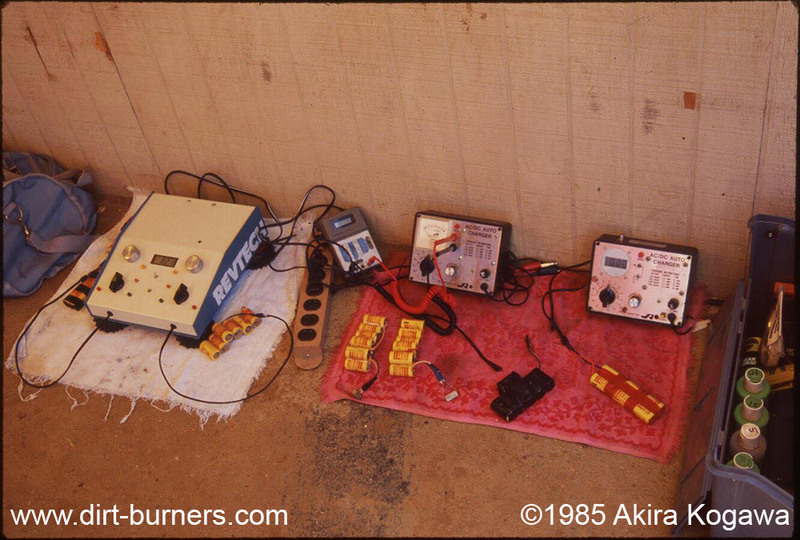 As I recall, the Japanese teams were racing mostly out of the box cars and were just not that fast with all of the things we were doing to our cars at the time (including running 7 cells to their 6). Del Mar was not where most of the racers lived…most of us lived in the LA area and traveled to the Del Mar race (where most of the tracks were). 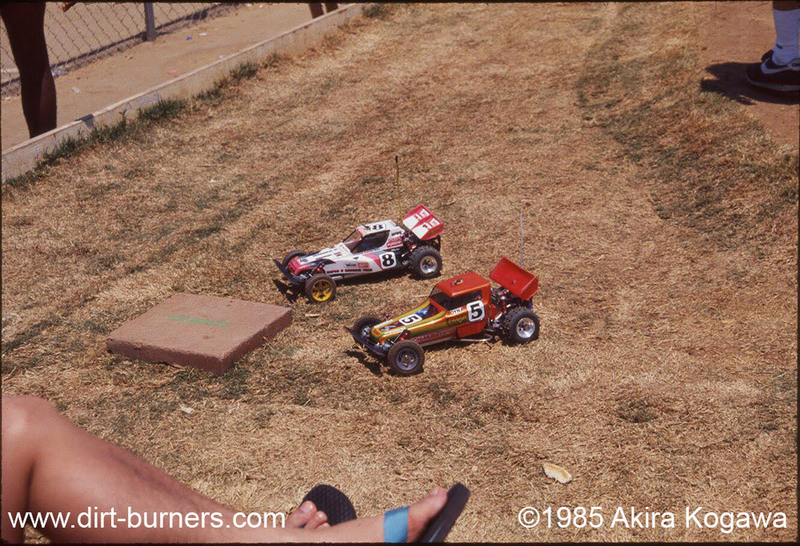 The Losi’s had just bought the skateboard park and used this to bring attention to the new track down by San Diego but we all came down to race. It’s great taking some time and being able to remember how much fun this was. Thanks you for sharing and feel free to contact me about more info. This info is very welcomed. I will have to try to locate the site of the Colton track then. I will be contacting you later, and thank you once again! Let me know if you have any private photos from this event (or know about anyone else who might have) that you would like to share.